Hi, welcome to my office at the a Max Planck Institute for Radio Astronomy, in Bonn! First, let's have a look around! Fig. 1a: A wide view of the office. Photo by Aris Noutsos. Fig. 1b: A narrower view towards some of the most complex models of 4-dimensional polytopes. Photo by Aris Noutsos. Fig. 1c: This is me in my polytope garden, holding a projection of the Grand Antiprism in 3 dimensions! Photo by Aris Noutsos. A few decades ago, I started noticing polyhedra, partly because of Carl Sagan's Cosmos, but also because of the art of M. C. Escher. This motivated me to build a few models of polyhedra and more recently projections of their 4-dimensional analogues, the polychora, into 3 dimensions. The recent models, built since 2009 and currently in my office, are the topic of this page. 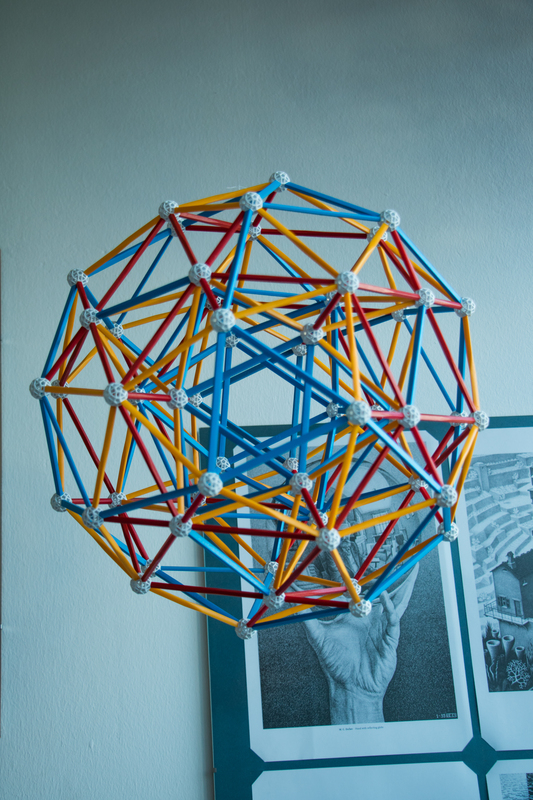 Previously (in the late 1990's) I built a significant number of models of Uniform polyhedra; these are in my parents' country house, in Portugal. 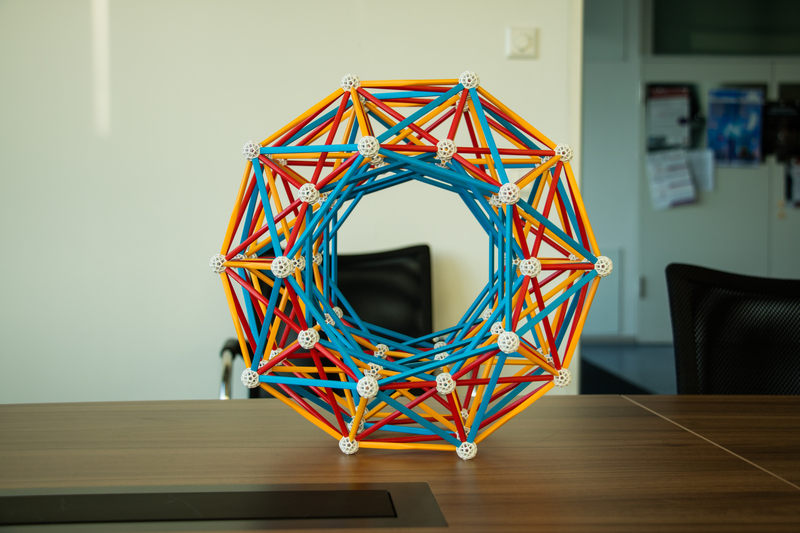 2019 January 26: built model of Gosset's 8-dimensional figure. 2018 December 19: completed the compound of 15 16-cells. 2018 August 4: Completed the compound of 5 24-cells. 2017 November 11: Completed the Great grand stellated 120-cell. This completes the list of projections of all 16 regular polychora. 2017 November 2: Some of my models are being displayed at the Gutenberg store in Bad Godesberg. See poster here by Ⓒ Zometool Europa / Lyn Taylor, with photos by Aris Noutsos and Jason Wu. 2016 November 12: Completed larger scale version of the rectified 120-cell. 2016 February 13: Completed rectified 600-cell. 2015: Moved to new office. 2014 August 21: Completed model of the Grand 600-cell. 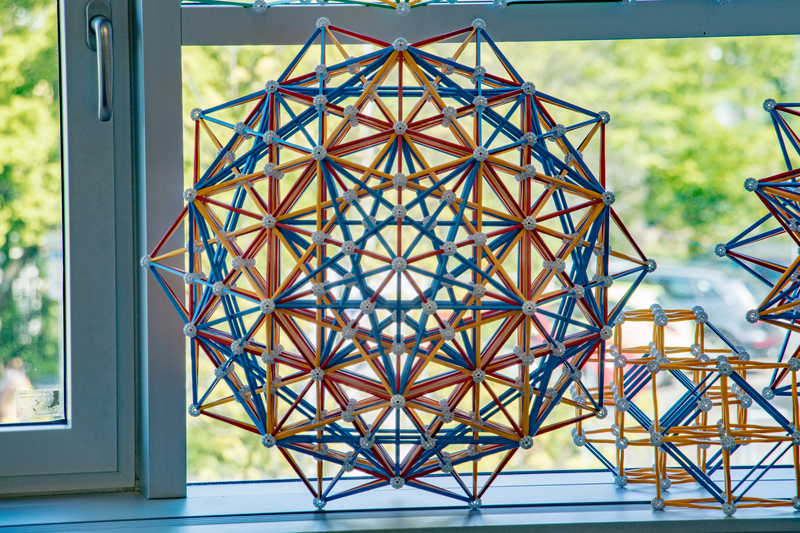 2014 August 6: Completed model of the stellated 120-cell. In ``King of Infinite Space: Donald Coxeter, the Man Who Saved Geometry'', by Siobhan Roberts. The nine regular polyhedra. These are transitive on their vertices (isogonal), on their edges (isotoxal) and faces (isohedral). It follows from this that their faces are regular polygons, i.e., the faces are regular. The seven quasi-regular polyhedra. These are isogonal and isotoxal but not isohedral (the faces are all regular, but not all identical). The quasi-regular dual polyhedra. These are isotoxal and isohedral, but not isogonal (the faces are all identical, but not regular). The sixteen regular and quasi-regular polyhedra have profound similarities since they are uniform polyhedra sharing the same Wythoff construction, and thus have similar Wythoff symbols: Their vertices are reflections of one of the 3 vertices of the Schwarz triangle, the fundamental domain of their corresponding 3-D point symmetry group. 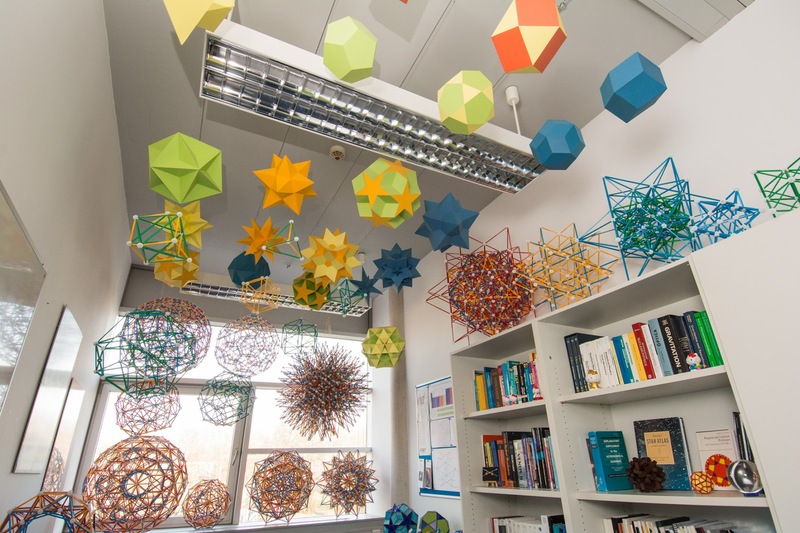 Different Wythoff constructions would result in other types of uniform polyhedra, like the remaining Archimedean polyhedra (which include the Truncated icosahedron that everyone asks about when they come to my office - no, I don't have that model in my office). For the following pictures of polyhedra, the colour code is as follows: the non-regular faces are blue, they belong to the duals of the quasi-regular polyhedra; for the regular faces, the equilateral triangles are yellow, squares are red, pentagons are green and pentagrams are gold. Since the latter are regular polygons, the polyhedra built from them shown below are either regular or quasi-regular. Thus, when we discuss e.g., the regular Tetrahedron, we use simply the word Tetrahedron, and likewise for Octahedron, Icosahedron and Dodecahedron. Fig. 2: The convex polyhedra. Bottom row, from right to left: 1 - The Tetrahedron (the only model that has tetrahedral symmetry), 2 - its rectification, the Octahedron, 3 - the dual of the Octahedron, the Cube, 4 - the rectification of the Cube and Octahedron - the Cuboctahedron and 5 - the dual of the Cuboctahedron, the Rhombic dodecahedron (these last four have octahedral symmetry). Top row, right to left: 1 - the Icosahedron and 2 - its dual, the Dodecahedron, 3 - the rectification of the Icosahedron and the Dodecahedron - the Icosidodecahedron and 4 - the dual of the Icosidodecahedron, the Rhombic triacontahedron (these four have icosahedral symmetry). 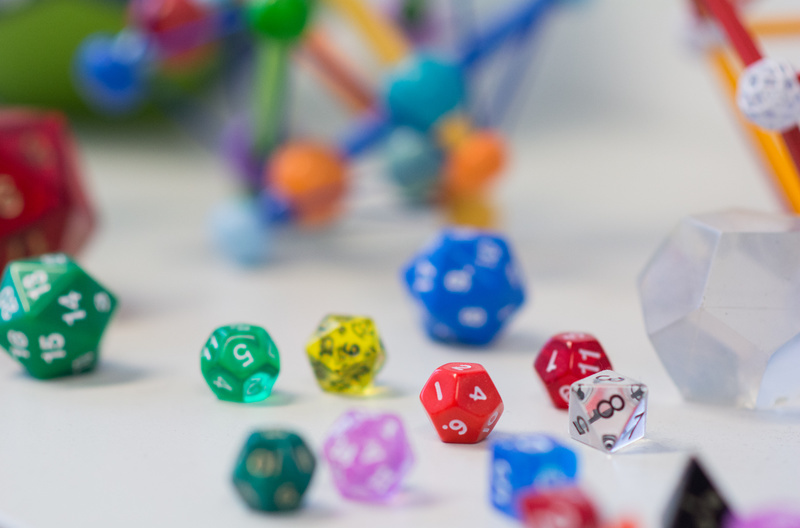 The five polyhedra on the right (Tetrahedron, Octahedron, Cube, Icosahedron and Dodecahedron) are the five platonic polyhedra, the only regular convex polyhedra. The Cuboctahedron and Icosidodecahedron (those with two colors) are the only convex quasi-regular polyhedra, and the two rhombic polyhedra in blue are their duals. Frame of picture taken by Jason Wu. Fig. 3: The platonic polyhedra, this time as dice. Picture by Aris Noutsos. 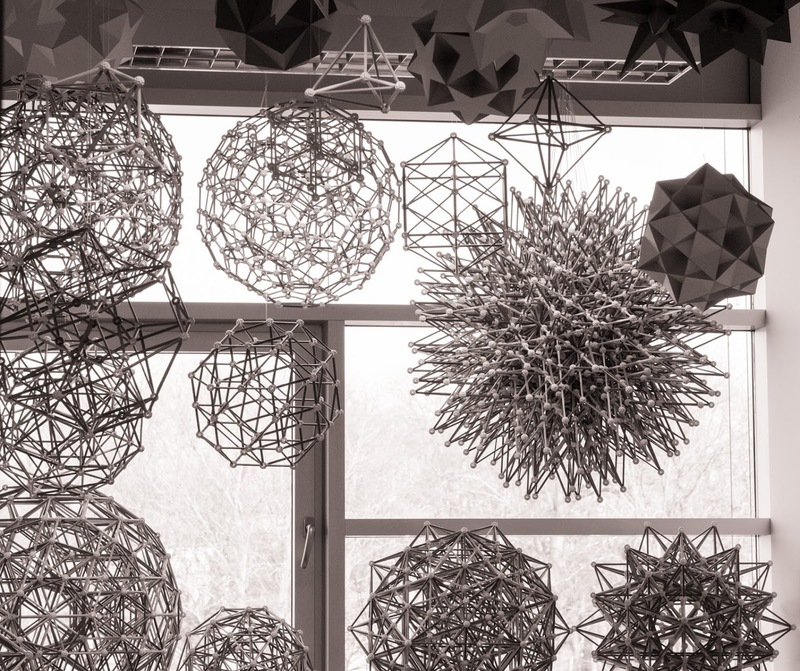 The vertices of all regular and quasi-regular polyhedra, like all uniform polyhedra, belong to a sphere that circumscribes the whole polyhedron and is concentric with it. The inner vertices are false: several edges intersect there, but none ends there. In what follows, we generally refer only to the true vertices. These vertices are arranged as either the Dodecahedron, Icosahedron or Icosidodecahedron in Fig. 3, i.e., they are facetings of these convex polyhedra which are therefore their convex hulls. By a general rule, their dual polyhedra are stellations of the duals of their convex hulls (The reason for this is simple: take line from a vertex to the centre of a polyhedron. The face of the dual polyhedron is perpendicular to this line. Thus, if we keep the same vertex arrangement for another polyhedron, we must keep the same set of perpendicular planes for the faces of its dual). Fig. 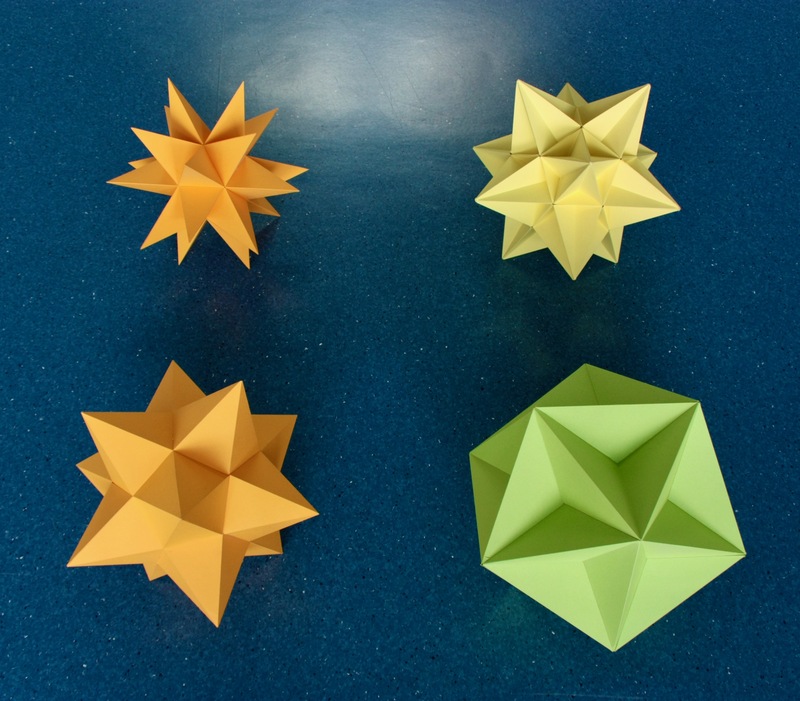 4: The four Kepler-Poinsot polyhedra: the Small stellated dodecahedron (top left) and its dual, the Great dodecahedron (bottom left), the Great stellated dodecahedron (top right) and its dual, the Great icosahedron (bottom right). The relations between the Dodecahedron, Icosahedron and the Kepler-Poinsot polyhedra are displayed in Fig. 5 below. The vertical scale indicates the density. Duality is given by the two-sided golden arrows. For each face of a polyhedron, there is a perpendicular line from the centre of the dual polyhedron to its vertex; for each edge of a polyhedron, the dual polyhedron has a perpendicular edge. The duality operation transforms the face of a polyhedron into the vertex figure of its dual. There are two ``stellation'' operations, that extend the faces of a particular polyhedron. The first, edge stellation, extends the edges of the faces (obviously in the same direction, but both ways) until they meet again, this is illustrated by the blue arrows. This can only start from polyhedra with pentagonal faces. The second operation, Greatening, replaces a face with a larger one of the same kind in the same plane; this is displayed by the green arrows. Both operations conserve the number of faces and their planes; therefore all polyhedra derived from the Dodecahedron (Great dodecahedron, Small stellated dodecahedron and Great dodecahedron) have 12 faces, as their names indicate. 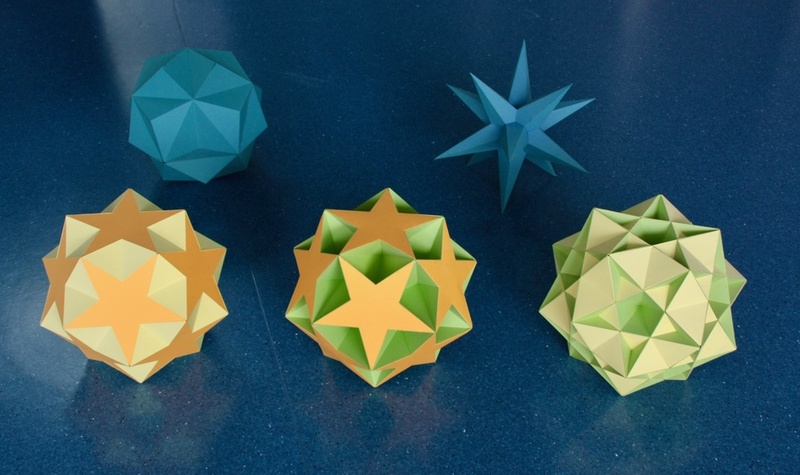 They represent the full set of stellations of the Dodecahedron; the model in Fig. 11b is useful to see how they can be derived geometrically by the process of extending the planes of the faces. The Great icosahedron, being a greatening of the Icosahedron, has 20 triangular faces. It is the only of the 59 stellations the Icosahedron that is regular. In Fig. 5 we also present the faceting, or ``conservation'' operations, which as we describe below are the duals of the stellation operations. The solid red lines indicate faceting with conservation of edge arrangement: Indeed, the Great dodecahedron has the same edge arrangement as the Icosahedron, and the Great icosahedron has the same edge arrangement of the Small stellated dodecahedron, as can be seen in Fig. 4. The dashed lines in Fig. 5 indicate faceting with conservation of the vertex figure. Both the solid red lines and the dashed lines imply conservation of the vertex arrangement, which all faceting operations must obey by definition. It follows from these conservation laws that the four polyhedra in the red circuit must share the same vertex arrangement - in this case of the Icosahedron. This means that they are facetings of the Icosahedron (see point number 3 above when introducing the non-convex polyhedra). The two polyhedra in the pink dotted line have the vertex arrangement and vertex figure of the Dodecahedron. Why these conservation relations exist is explained below. Fig. 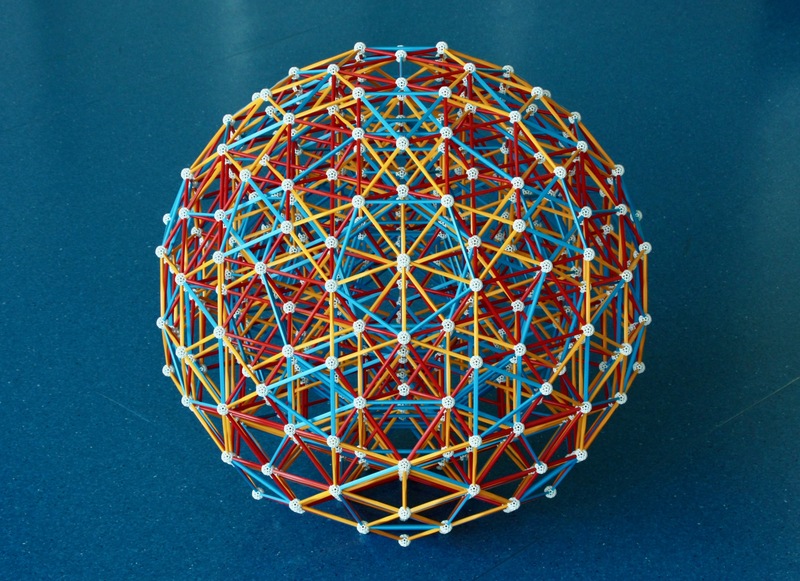 5: Relations between the Dodecahedron, Icosahedron and the Kepler-Poinsot polyhedra. (Technical bit: please skip if you're devoid of curiosity). As an example of 1), let's move from the Icosahedron to the Great dodecahedron along the solid red line. This is the same as finding the dual of the Icosahedron (Dodecahedron), edge stellating (Small stellated dodecahedron) and finding the dual of the latter (Great dodecahedron). The first operation transformed the edges of the Icosahedron into the perpendicular edges, those of the Dodecahedron. The second operation merely extended those edges, but kept their directions. The last operation find edges perpendicular to those of the Small stellated dodecahedron - those of the original Icosahedron! As an example of 2), let's move from the Dodecahedron to the Great stellated dodecahedron along the dotted pink line. This is the same as finding the dual of the Dodecahedron (Icosahedron), greatening (Great Icosahedron) and finding the dual of the latter (Great stellated dodecahedron). The first duality converts the triangular vertex figure of the Dodecahedron into the triangular face of the Icosahedron. Then greatening to a Great Icosahedron keeps the same type of face (as greatening always does). In the final dual transformation, the triangular faces of the Great Icosahedron are converted back to triangular vertex figures, as in the original Dodecahedron. Thus this operation preserves the vertex figure. All faceting operations preserve the vertex arrangements. This is because their dual (the stellation operations) preserve the planes of the faces. Fig. 6: Two quasi-regular star polyhedra and their duals. Top right: the rectification of the Great dodecahedron and the Small stellated Icosahedron - the Dodecadodecahedron, bottom right: its dual, the Medial rhombic triacontahedron; Top left: the rectification of the Great Icosahedron and the Great stellated dodecahedron - the Great icosidodecahedron, bottom left: its dual, the Great rhombic triacontahedron. The operation of rectification corresponds to finding the middle of the edges of a polyhedron and transforming it in a new vertex. Doing this for any two dual polyhedra results in the same polyhedron, since their edges are perpendicular and intersect at their midpoints. Rectifying the Kepler-Poinsot polyhedra, we always obtain the vertex arrangement of the Icosidodecahedron. We can see this easily from Fig. 5: the Small stellated dodecahedron can be obtained from the Dodecahedron by a symmetric (both ways) edge stellation. Thus the arrangement of the mid-points of its edges remained unchanged under edge stellation - it is still the arrangement of the vertices of the Icosidodecahedron. The same necessarily applies to its dual, the Great dodecahedron. The Great stellated dodecahedron can similarly be obtained from the Great dodecahedron by edge stellation, therefore the mid-points of its edges still have the same arragement as the vertices of the Icosidodecahedron. The same will necessarily apply to its dual, the Great icosahedron. 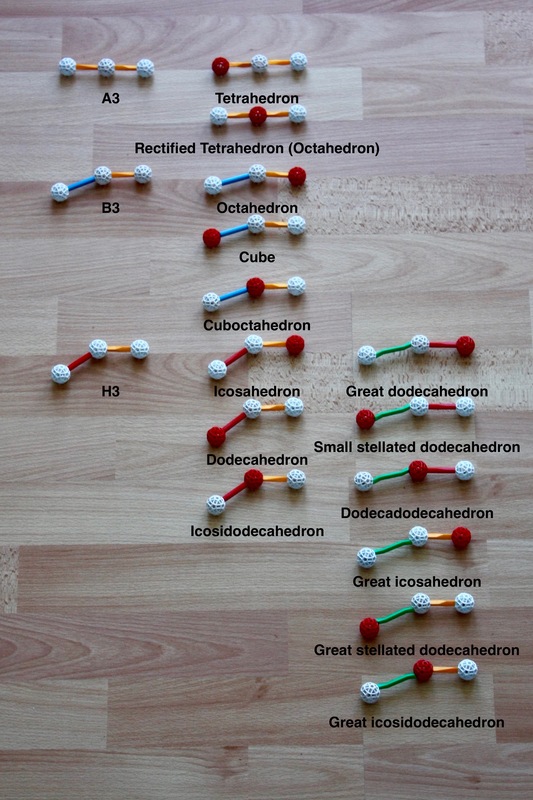 Thus these rectifications of the Kepler-Poinsot polyhedra (the Dodecadodecahedron and the Great Icosidodecahedron in the top row) are facetings of the Icosidodecahedron. This implies that their duals must be stellations of the dual of the Icosidodecahedron, the Rhombic triacontahedron. Fig. 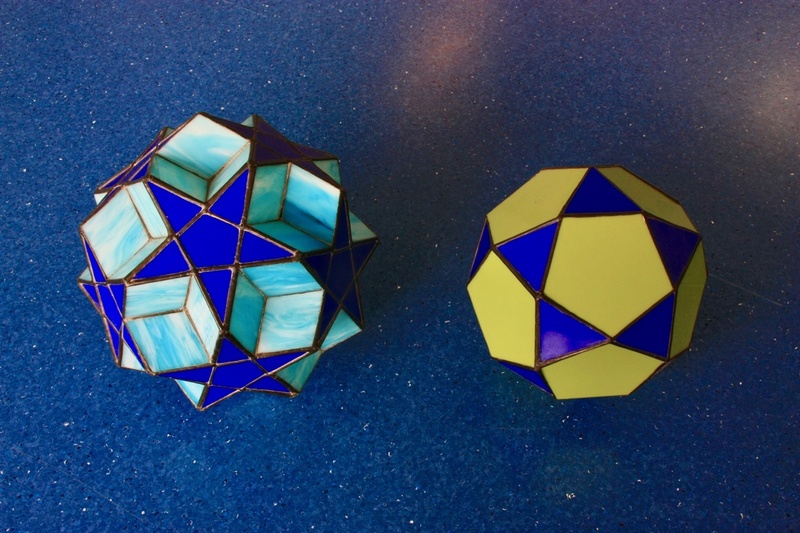 7: We now show a few of the facetings of the Dodecahedron, in particular the ditrigonal quasi-regular star polyhedra: The Small ditrigonal icosidodecahedron (left) and its dual, the Small triambic icosahedron (centre left, in blue), the Ditrigonal dodecadodecahedron (centre right) and its dual, the Medial triambic icosahedron (right, in blue), the Great ditrigonal icosidodecahedron (far right, in the foreground) and its dual, the Great triambic icosahedron (right, in blue) - this is represented by the same model as the Medial triambic icosahedron as they only differ in their internal structure. Since the ditrigonal star polyhedra are facetings of the Dodecahedron, their duals are, of course, stellations of the Icosahedron. The three ditrigonal quasi-regular polyhedra all share the edge arrangement of the compound of five cubes. The edges of their duals (in blue) (and the dual of the compound of five cubes, the compound of five octahedra) are perpendicular to the former, which means that they are all have the same directions - indeed, they can all be derived from the first stellation of the Icosahedron (the Small triambic icosahedron) by edge stellation. Picture taken by Aris Noutsos. Fig. 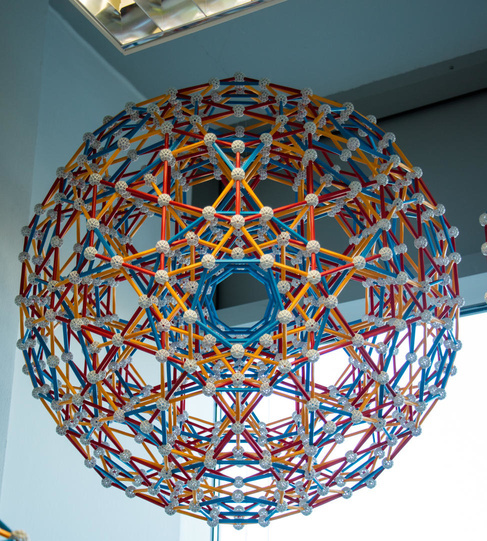 8: Not all polyhedron models are made of paper. Here is a stained glass dodecadodecahedron. Made by Naomi Janches. Before ending this section, it is important to remark that the regular and quasi-regular polyhedra shown above represent only a small fraction of the Uniform polyhedra. For more models of the latter, check my page on Uniform polyhedra. H. S. M. Coxeter, in the preface to ``Regular Polytopes''. 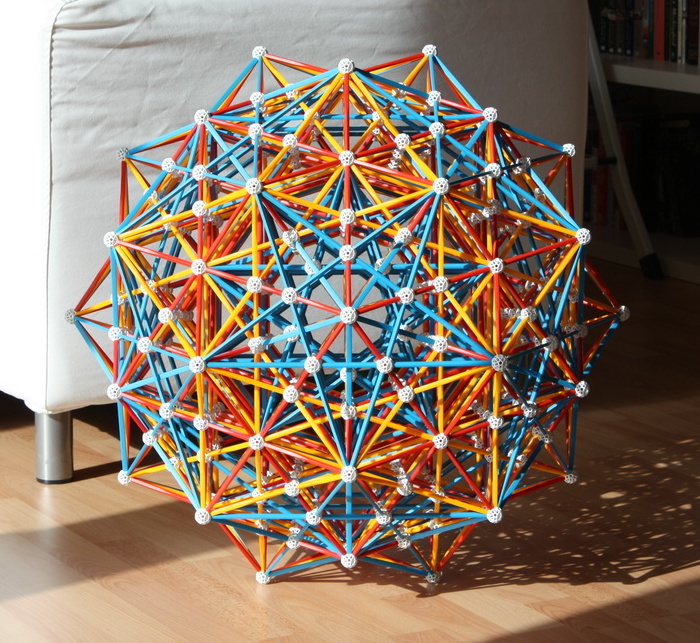 In 2014 I started building Zometool models. Such models display only the edge arrangements of a geometrical object. Therefore, they cannot display face arrangements. 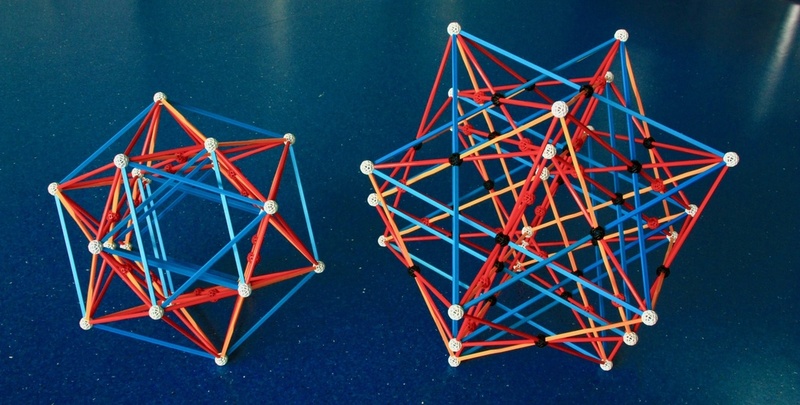 A consequence of this is that the Icosahedron and the Great dodecahedron, which share the same edge arrangements, are represented by the same Zometool model. The same would happen for the Small stellated dodecahedron and the Great Icosahedron. The three ditrigonal quasi-regular polyhedra in Fig. 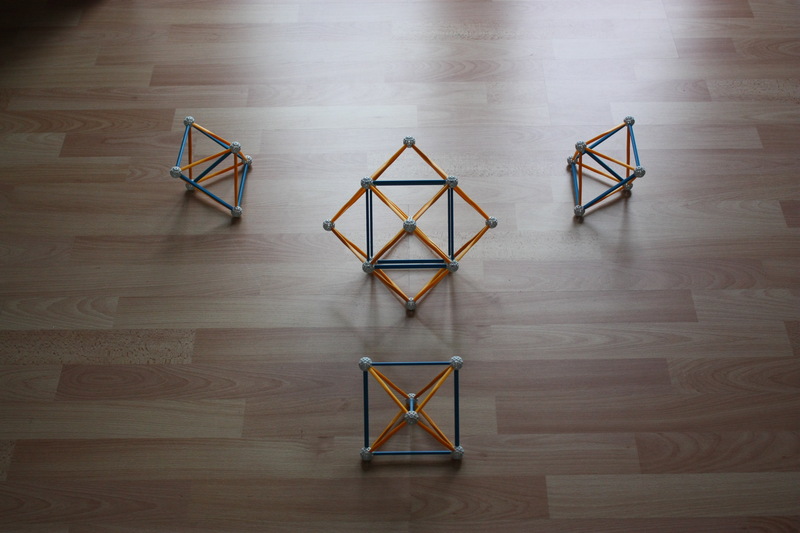 7 and the compound of five cubes are all represented by the same Zometool model (see below). 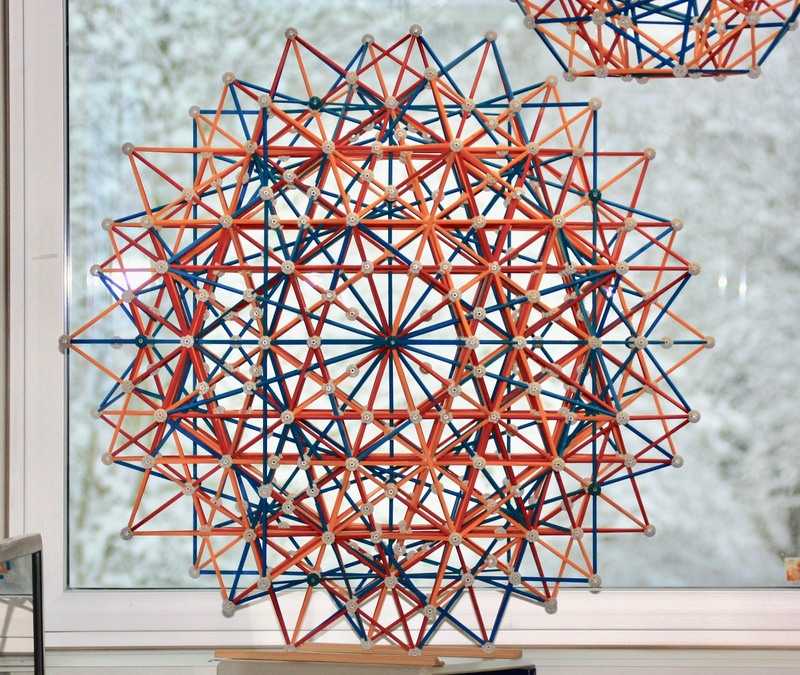 The main advantage of Zometool models, however, is that they allow the display of internal structure; for the models that follow that is absolutely necessary. 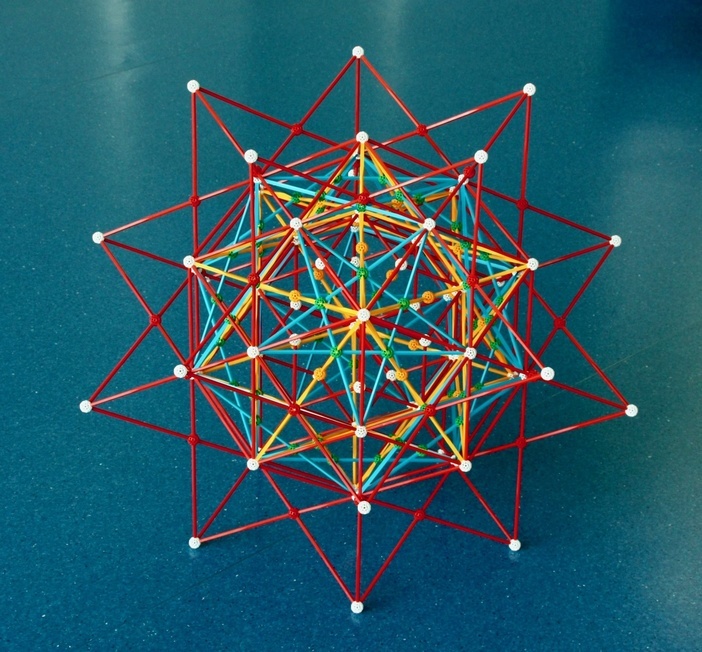 As an example, in the Zometool model below I display a model that shows many geometric relations between the Platonic polyhedra. This particular kit also extremely useful for me to familiarize myself with the extremely interesting properties of Zometool, something that I suggest the reader does before attemptiong to build any of the models that follows. Fig. 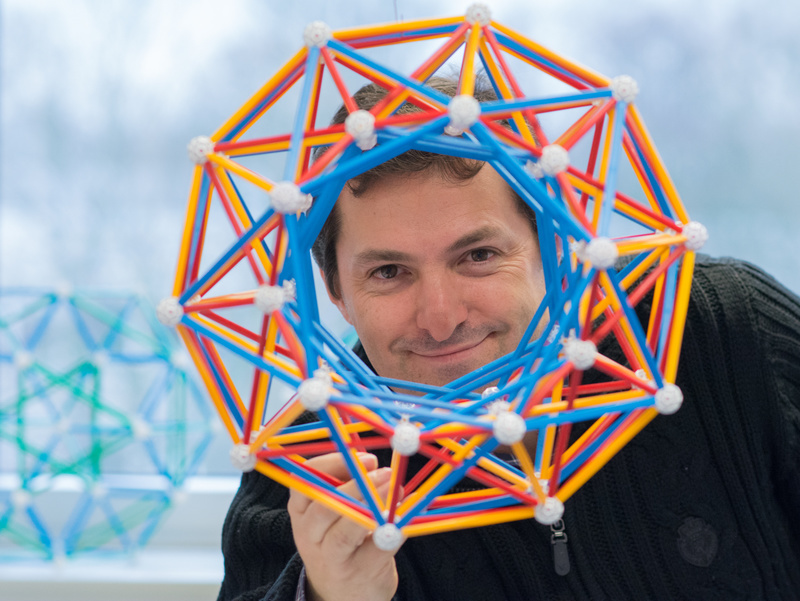 9: Myself holding a beautiful geometrical model that illustrates many interesting relations between the Platonic polyhedra and their symmetries. 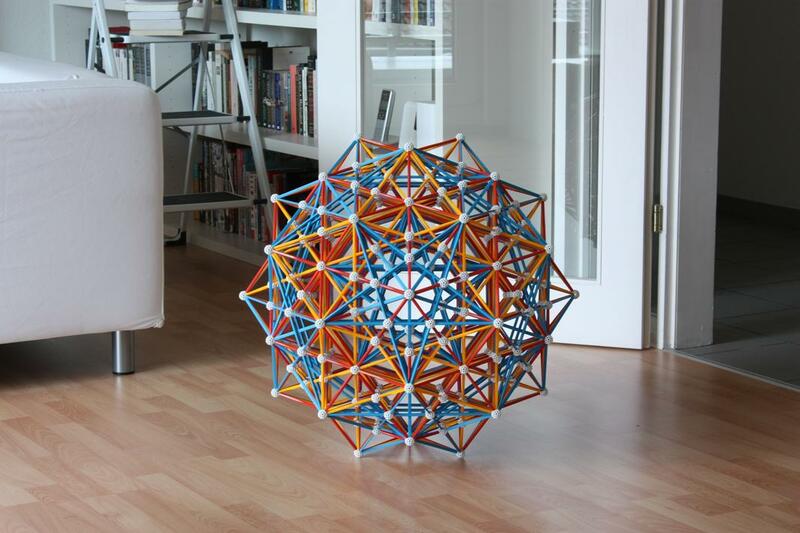 This is sold by Zometool as Kepler's Kosmos, and was designed originally by John H. Conway. Photo by Aris Noutsos. The models below represent stellations of the five convex isohedral polyhedra shown in Fig. 3 that can be stellated. This set consists of 3 Platonic polyhedra (the Octahedron, Dodecahedron and Icosahedron) plus the Rhombic dodecahedron and Rhombic triacontahedron. Being isohedral, they have only one stellation diagram; this makes the model much easier to plan and results in more appealing models. Among these stellations we find many of the polyhedra shown above plus some interesting regular polyhedron compounds. 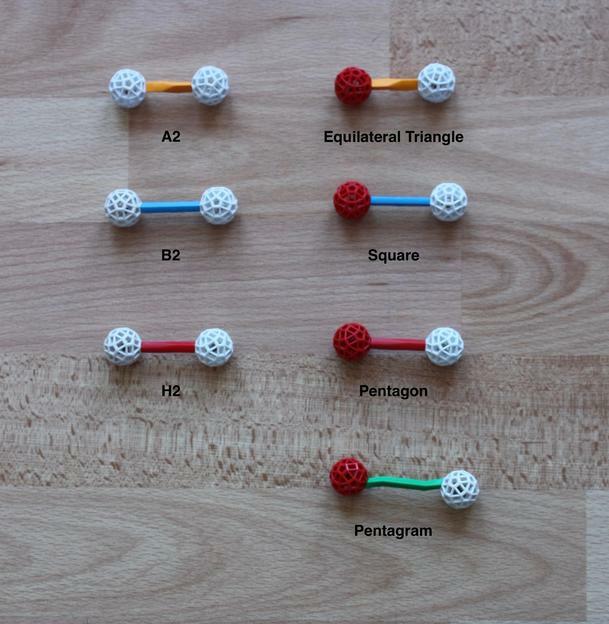 Note: Three of these models use non-standard, extra-long Zometool parts. These can be built with regular parts with a ball and two struts, but the results are not so satisfying. If you'd like to acquire extra-long parts, I suggest purchasing old Zometool sets on eBay. Fig. 10: Myself holding a model of an Octahedron with its only possible stellation, known as the Stella Octangula. 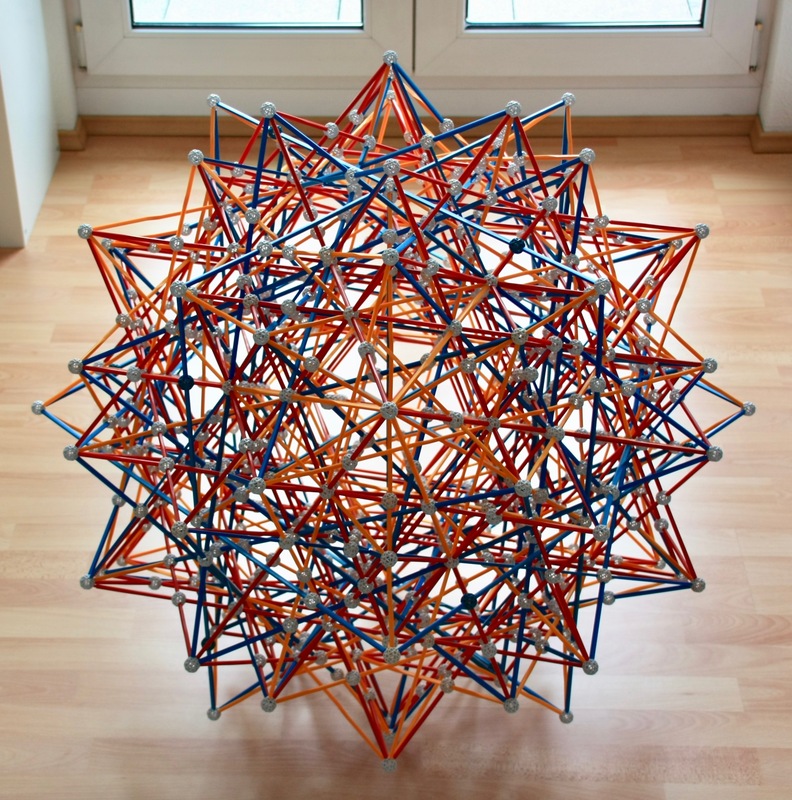 This can also be seen as an intersection of two Tetrahedra. The outer vertices are those of a cube. These relations can be seen in the model above. Photo by Aris Noutsos. Fig. 11a: This is the stellation pattern of the Dodecahedron; its face is the inner pentagon. The inner pentagram is the face of the Small stellated dodecahedron. The outer pentagon is the face of the Great Dodecahedron, and the outer pentagram is the face of the Great stellated dodecahedron. Fig. 11b: Extending the 12 faces of the Dodecahedron as in Fig. 11a, we obtain the four stellations of the Dodecahedron listed in Fig. 11 a. Fig. 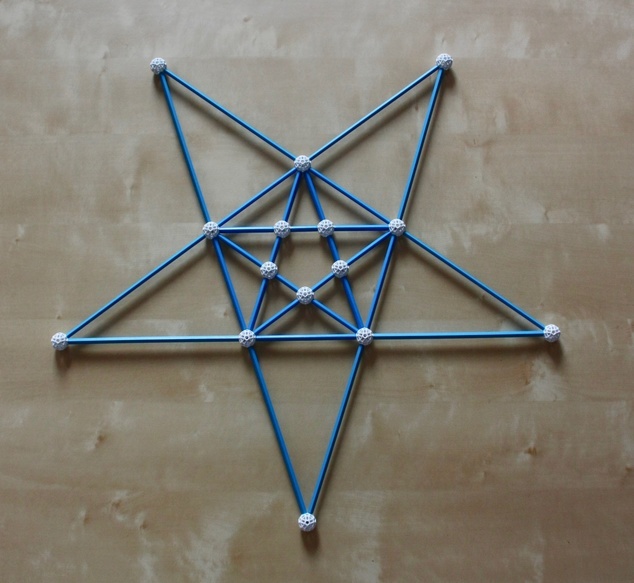 12a: An incomplete stellation diagram of the Icosahedron, representing some of the figures that can be built with a small Zometool model. The inner Triangle if the face of the Icosahedron, the Green triangle is a face of the compound of five Tetrahedra and the outer triangle is a face of the Great icosahedron. 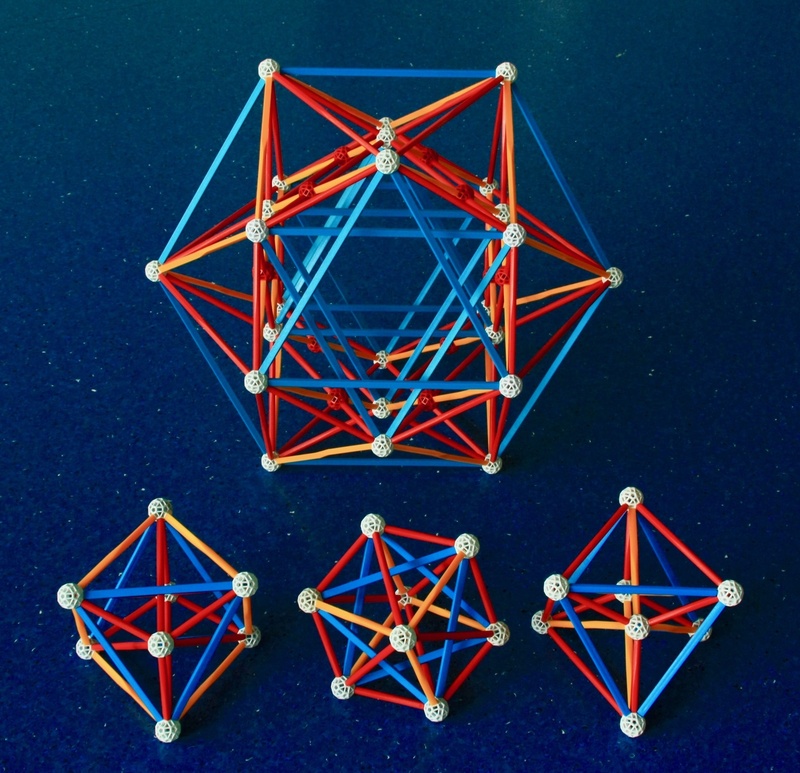 An intermediate figure where each face is composed of three disjointed (blue) triangles, touching the face of the Icosahedron at its vertex, is the self-dual Excavated dodecahedron (which is, therefore, another faceting of the Dodecahedron). These are only four of the 59 stellations of the Icosahedron, some others were presented already in Fig. 7. Fig. 12b: Extending the 20 faces of the Icosahedron as shown above, we have the four stellations of the Icosahedron mentioned above. Fig. 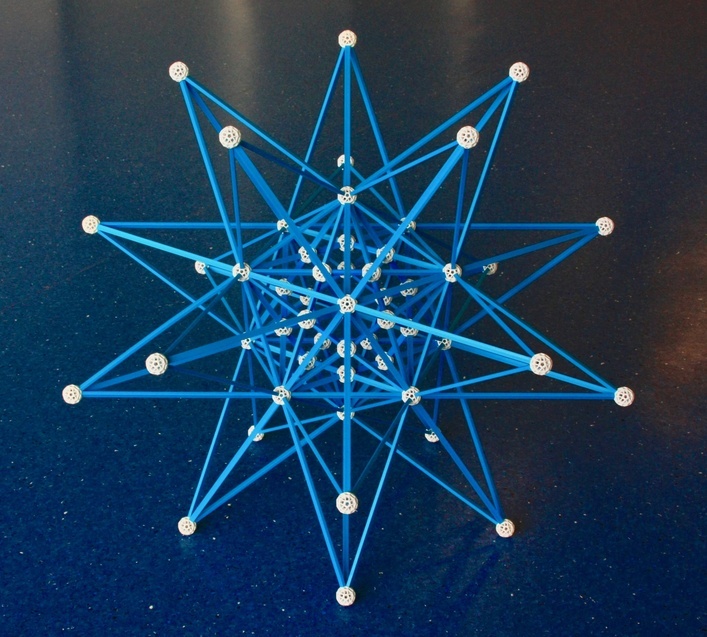 13a: The stellation diagram of the Rhombic dodecahedron built with Zometool. The inner diamond if the face of the Rhombic dodecahedron. Fig. 13b: The four stellations of the Rhombic dodecahedron. Each of the 12 faces of the Rhombic dodecahedron has been extended along their planes as shown above. Fig. 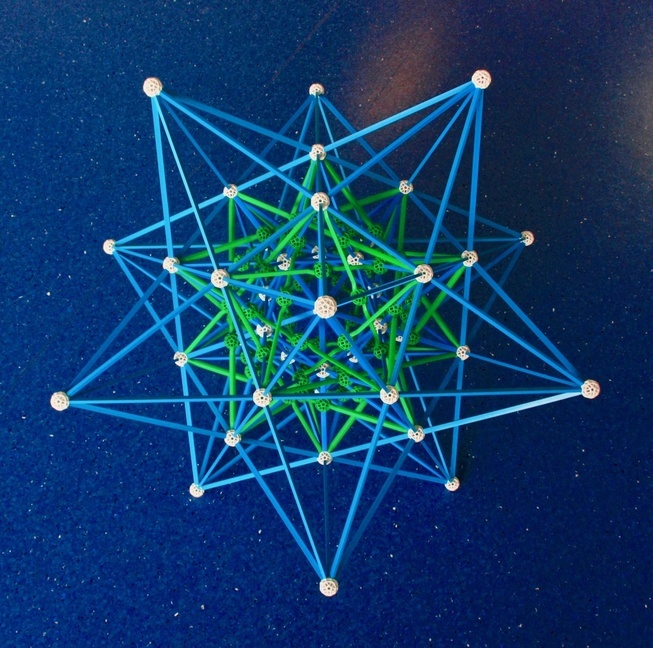 14a: The inner region of the stellation diagram of the Rhombic triacontahedron built with Zometool. The outer Rhombus is the face of the Great rhombic triacontahedron. All other struts represent intersections of its 30 rhombic faces. Fig. 14b: Excluding most struts and connectors, we see the faces of some of the more important stellations of the Rhombic triacontahedron. The inner red Rhombus is one of the 30 faces of the Rhombic triacontahedron. The yellow Rhombus is one of the 30 faces of the Medial rhombic triacontahedron. The blue square is one of the 30 faces of the compound of 5 cubes. As in Fig. 14a, the outer Rhombus is one of the 30 faces of the Great rhombic triacontahedron. Fig. 14c: Extending the 30 faces of the Rhombic triacontahedron along their planes we obtain its stellations. If we include only the four stellations mentioned in Fig. 14b, then we obtain this model. The four stellations can be found very easily since they are represented by different colours. This is the model currently in my office since it is consistent with the ``4 stellations'' theme set by the previous models. Fig. 14d: If, for each facial plane we include the complete set of struts and balls as in Fig. 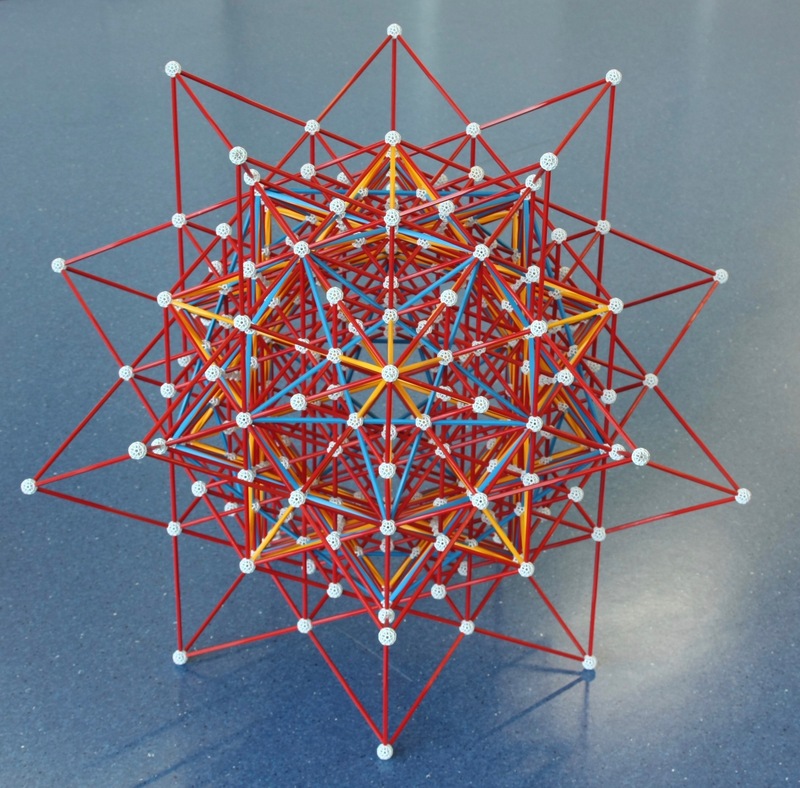 14a, then we obtain this model, which represents many of the stellations of the Rhombic triacontahedron up to the Great rhombic triacontahedron (the outer shape). As in Fig. 14a, every line represents the intersection of two faces of the Great rhombic triacontahedron. For more on the latter models, see my page on the many stellations of the Rhombic triacontahedron. ``As for the analogous figures in four or more dimensions, we can never fully comprehend them by direct observation. In attempting to do so, however, we seem to peep though a chink in the wall of our physical limitations, into a new world of dazzling beauty." H. S. M. Coxeter, in the preface of ``Regular Polytopes". The generalization of polygons in 2 dimensions and polyhedra in 3 dimensions to any number of dimensions is a polytope. I am particularly interested in 4-dimensional polytopes, the polychora, which are finite regions of 4-D space bound by polyhedral 3-faces, or cells. Among an unknown number of uniform polychora, sixteen (again!) are regular: six are convex and ten are non-convex; the latter are known as the Schläfli-Hess polychora. 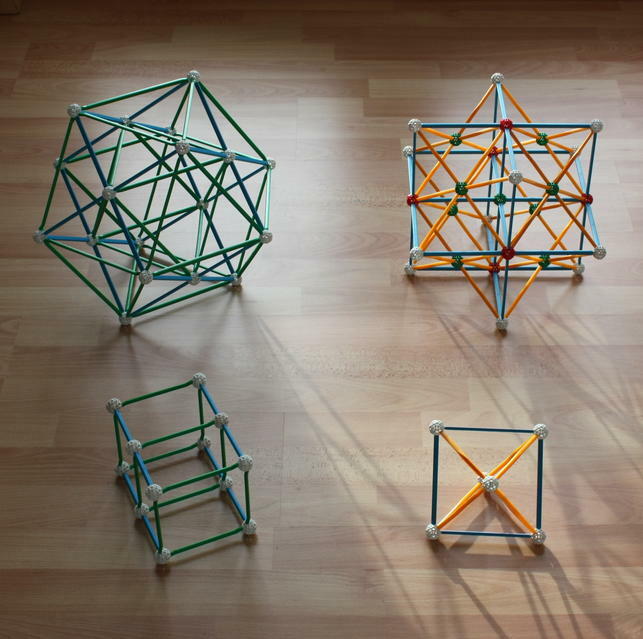 All have orthographic projections to 3-dimensional space that can be depicted in the Zometool system, these are shown below. 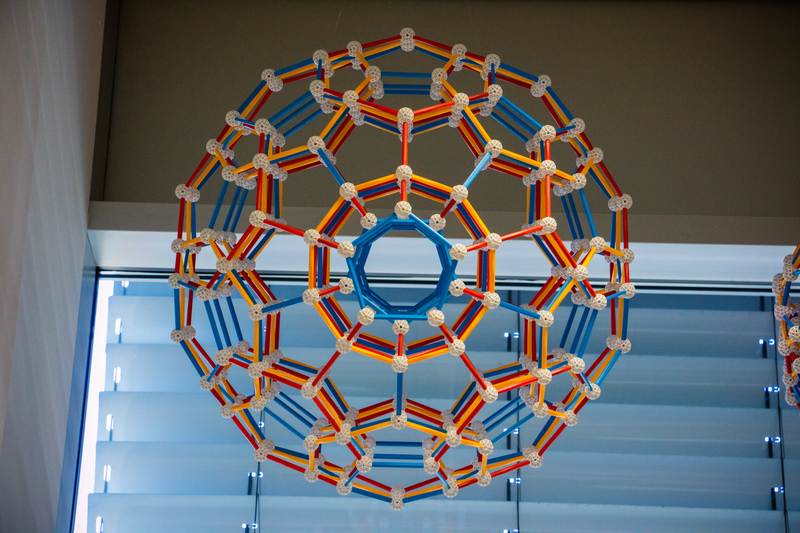 Since all these models have a lot of important internal structure, there is no alternative to building them in Zometool: a paper model would hide the internal structure of the projection. For the convex regular polychora, we also display the corresponding rectified polychora. These are, among the uniform polychora, the 4-D equivalents of the quasi-regular polyhedra discussed above. As in 3 dimensions, the regular polychora and their rectified versions share the same Wythoff construction: Their vertices are reflections of one of the four vertices of the Goursat tetrahedron, the fundamental domain of their 4-D point symmetry group. This implies that for each dual pair of dual regular polychora, there are two rectified polychora. In three dimensions, for each pair of dual regular polyhedra there is only one rectified (or quasi-regular) polyhedron. All of these rectified polychora have orthographic projections that can be depicted in the Zometool system. Fig. 15a: Front row: Vertex-first projections of three convex regular polychora: On the left is the simplest regular polychoron, the 5-Cell, which is bound by 5 Tetrahedral cells and has 5 vertices, with Tetrahedral vertex figures. This is the 4-dimensional analogue of the Tetrahedron. In higher dimensions, the analogues are known as Simplexes, all of them self-dual. This is one of the few projections in this page where the "near" and "far" sides of the projections do not coincide. At the centre is the vertex-first projection of the 16-cell, which is bound by 16 Tetrahedral cells and has 8 vertices with Octahedral vertex figures. This the 4-D analogue of the Octahedron. The analogues in any dimension are known as Orthoplexes. On the right is the projection of its dual, the 8-Cell, more commonly known as the Tesseract. This is bound by 8 Cubes and has 16 vertices with Tetrahedral vertex figures. This is the 4-D Hypercube. As one might expect, Tesseracts can fill 4-D space, but more interestingly, the 16-cell can do that as well: The vertex arrangement of this 16-cell honeycomb is known as the F4 lattice. If a 3-sphere is centered in each point of this lattice, the resulting arrangement is the densest possible regular sphere packing in 4 dimensions, with kissing number 24. In the row further back are the rectifications of these polychora (also, rectifications of the particular projections in the first row). On the left is the cell-first projection of the Rectified 5-cell. For each of the 5 Tetrahedra of the 5-cell, this has 5 rectifications of the Tetrahedron, or Octahedra. Each vertex of the 5-cell was replaced by its vertex figure, a Tetrahedron. This is one of the 3 non-regular uniform polychora that has only regular cells, these are known as a Semi-regular polychora. In particular, this is a member of a multi-dimensional family of Semi-regular polytopes, where the facets are Simplexes and Orthoplexes, known as the k21 polytope family, where k is the dimension − 4. Thus the Rectified 5-cell is the 021 polytope. More about this family below. This is another of the projections in this page where the "near" and "far" sides of the projections do not coincide. In the middle is a cell-first projection of the Rectified 16-cell. More about this object below. 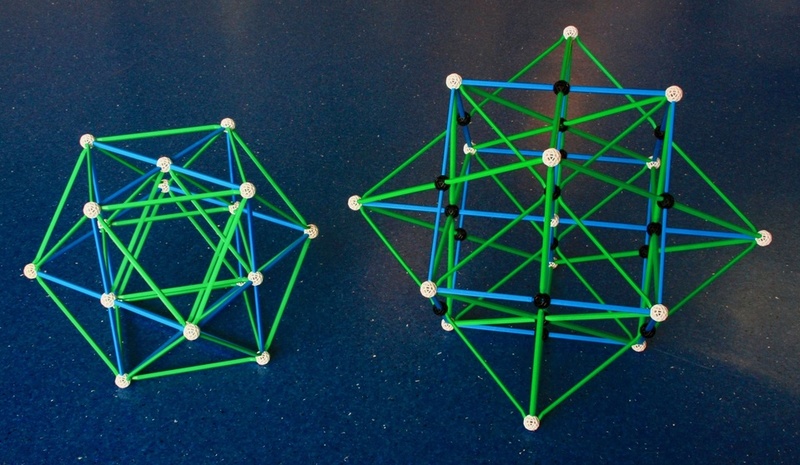 On the right is tetrahedral cell-first projection of the Rectified tesseract. Each of the 8 Cubes of the Tesseract was replaced with rectifications of the Cube, Cuboctahedra. Each of the 16 vertices of the Tesseract was replaced by the Tesseract's vertex figure, Tetrahedra. This is another case of a model where the "near" and "far" sides of the projections do not coincide: this is the reason why the model displays two crossed Tetrahedra at the centre (the "Stella Octangula" design). The two models on the left have pentachoric symmetry, the other four share the hexadecachoric symmetry, but one of them (the Rectified 16-cell, below) has a higher degree of symmetry. Fig. 15b: In Fig. 15a we displayed the vertex-first projections of the 16-cell and Tesseract. Here we display, in the front row, their cell-first projections. Behind them we display the rectifications of these polychora, specifically rectifications of these projections. The projection of the rectified Tesseract (top right) is different from that shown in Fig. 15a: Instead of being centered on a Tetrahedron, it is centered on a Cuboctahedron. However, the rectification of the cell-first projection of the 16-cell is identical to the rectification of the vertex-first projection in Fig. 15a. This is because both are centered on Octahedra. There is a deeper, and rather beautiful reason for this, see Fig. 29. This projection of the 16-cell is especially good for highlighting its 8 vertices separately. These represent half of the vertices of the Tesseract, its dual polytope, i.e., the 16-cell is a ``Demi-tesseract'', the 4-D Demi-hypercube (the 3-D version, the Tetrahedron is a ``Half-cube'', see the ``Stella Octangula'' model in Fig. 10). This particular projection also depicts two superposed 16-cells that together have all the vertices of the Tesseract. Note: the two models on the right are not permanently in my office. Fig. 16: Left: Yet again, the Rectified 16-cell. For each of the Tetrahedral cells of the 16-cell, this has their rectifications, 16 Octahedra. The 8 vertices of the 16-cell are here replaced by the latter's vertex figures, also Octahedra. 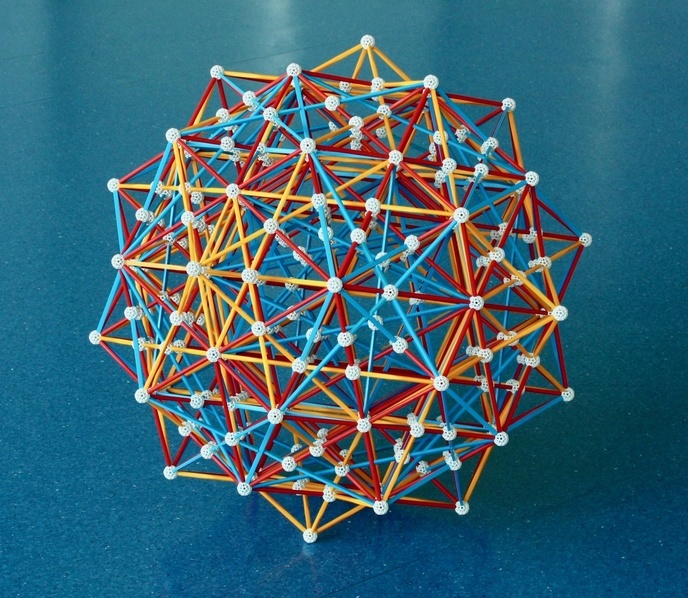 This is therefore a regular polychoron bound by 24 Octahedra in total; it is more commonly known as the 24-cell, or Polyoctahedron. This polychoron has many interesting characteristics: It is a self-dual polychoron with no analogue in any dimension other than 4. Its 24 vertices are those of the Tesseract and the 16-cell combined, or the combination of three 16-cells (since the 16-cell is a Demitesseract). Any model of the 24-cell will also represent a regular polychoron compound, with three Tesseracts. For more on this see Figs. 31a and 31b. The 24-cell can fill 4-D space, in what is known as the regular Icositetrachoric honeycomb. This is dual to the 16-cell honeycomb mentioned in the caption to Fig. 15a. Right: A cuboctahedral cell-first projection of the Rectified 24-cell. For each Octahedron of the 24-cell the latter has 24 Cuboctahedra (the rectification of the Octahedron). For each of the 24 vertices of the 24-cell, the Rectified 24-cell has a Cube (the vertex figure of the 24-cell). This polychoron has 96 vertices, one for each edge of the 24-cell. You can see how to build this model in the Eusebeia page on the Rectified 24-cell (for this particular model, see the part on the "Cantellated 16-cell"). Both polychora have icositetrachoric symmetry. Picture taken by Jason Wu. Fig. 17: This is an Icosahedral cell-first projection of a convex uniform polychoron, the Snub 24-cell. This can be built from the Rectified 24-cell in Fig. 16 by diagonally bisecting all squares. If the diagonals are chosen correctly, then each of the 12 vertices of the Cuboctahedron now has 5 edges converging on it, i.e., it has been transformed into an irregular Icosahedron. 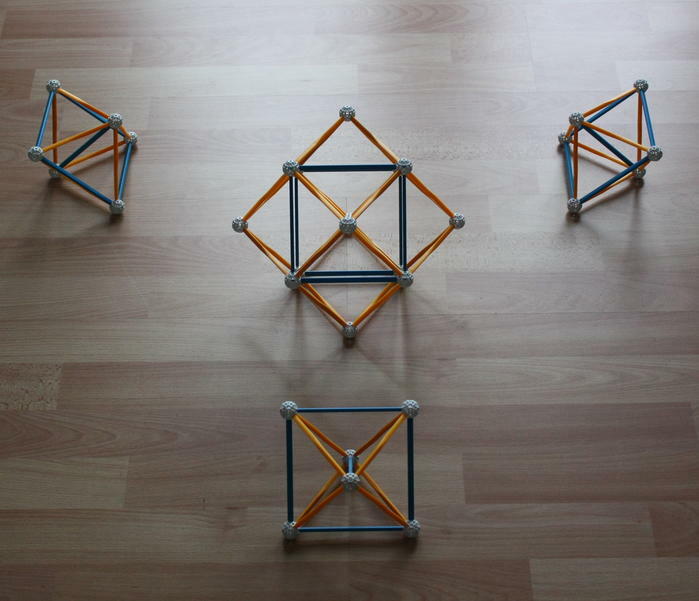 The Cubes have been transformed into sets of 5 Tetrahedra, with only the central one being regular. Then we shorten the diagonals of these former squares in order to make two regular triangles. This generates one regular Icosahedron for each of the previous 24 Cuboctahedra, and five regular Tetrahedra for each of the 24 previous Cubes, making a total of 120 Tetrahedra. This operation preserved the number of vertices, which is still 96. Because all cells are regular, this is also a semi-regular convex polychoron. Unlike the polychoron models shown above, this polychoron is neither regular nor a rectification, i.e., its Wythoff construction is very different from most polytopes in this page. The vertices and edges of this model are a subset of those of the model of the 600-cell just below, i.e., this is a diminished 600-cell. 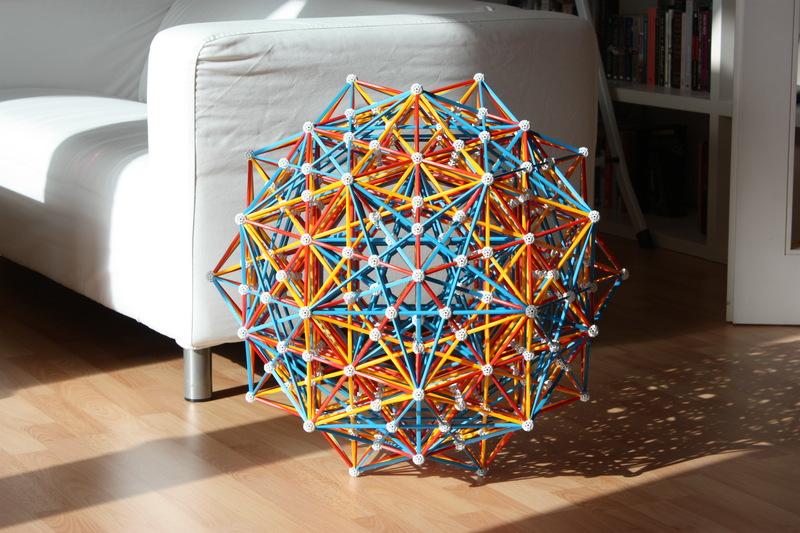 You can see how this might be built from Zometool parts by looking at the Eusebeia page on the Snub 24-cell. Also recommended is David Richter's page on the 24-cell and its snub. Fig. 18: This is the vertex-first projection of a regular polychoron known as the 600-cell, or Polytetrahedron (see instructions in David Richter's list of Zometool projects). This is a 4-D analogue of the Icosahedron. This polychoron can be built from the Snub 24-cell in Fig. 17 by adding on ``top'' of each of the latter's 24 Icosahedra a 4-D ``Pyramid'' consisting of an Icosahedral ``base'' and 20 regular Tetrahedra as ``sides''. The 24 apices of these Pyramids have the same arrangement as the vertices of a 24-cell. Together with the previous 96 vertices of the Snub 24-cell, they add to a total of 120 vertices. The 120 Tetrahedra of the Snub 24-cell are now joined by the 24 × 20 Tetrahedra = 480 Tetrahedra of the new 4-D ``Pyramids'', making a total of 600 Tetrahedral cells. The apices of the new ``Pyramids'' have Icosahedral vertex figures, this is true for all other vertices as well because the 600-cell is regular. The high degree of symmetry of the 600-cell implies that there is nothing special about the new 24 vertices added to the Snub 24-cell to form the 600-cell. Just as the latter have the same arrangement as the vertices of the 24-cell, the previous 96 vertices can be decomposed into 4 groups of 24 vertices, each also with the same arrangement as the vertices of a 24-cell. This means that from the set of 120 vertices of the 600-cell we can also build a set of five 24-cells, the latter is a self-dual regular polychoron compound and is shown in Figs. 32a and 32b. Fig. 19: This is the cell-first projection of the dual of the 600-cell, the 120-cell, or Polydodecahedron. This is bound by 120 Dodecahedra, it has 600 vertices with Tetrahedral vertex figures; this is a 4-D analogue of the Dodecahedron. 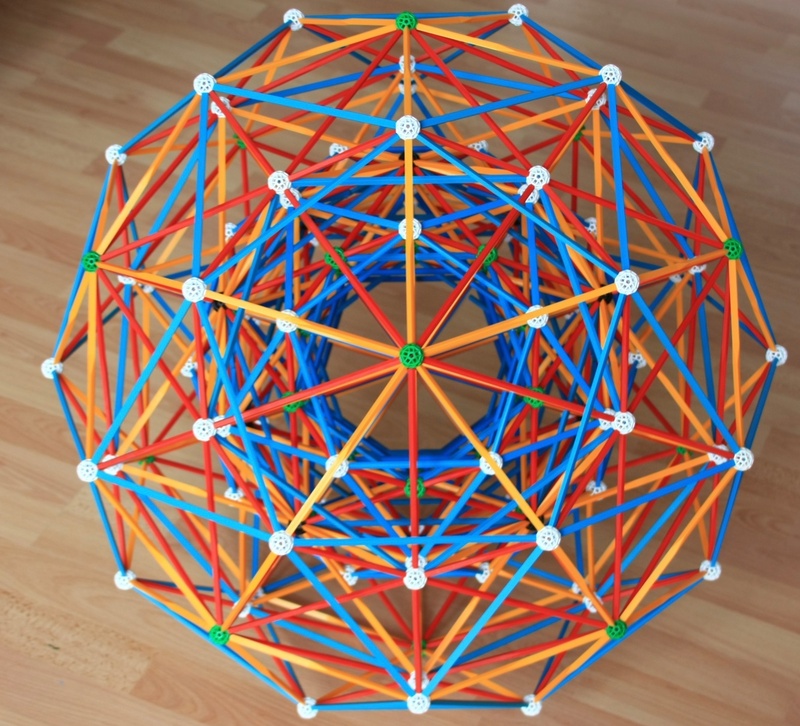 This model is larger than the set sold by Zometool as the hyperdo by φ, the famous golden ratio, φ (it is also φ times smaller than the Jumbo version of the hyperdo). Fig. 20: The icosahedral cell-first projection of the Rectified 600-cell. 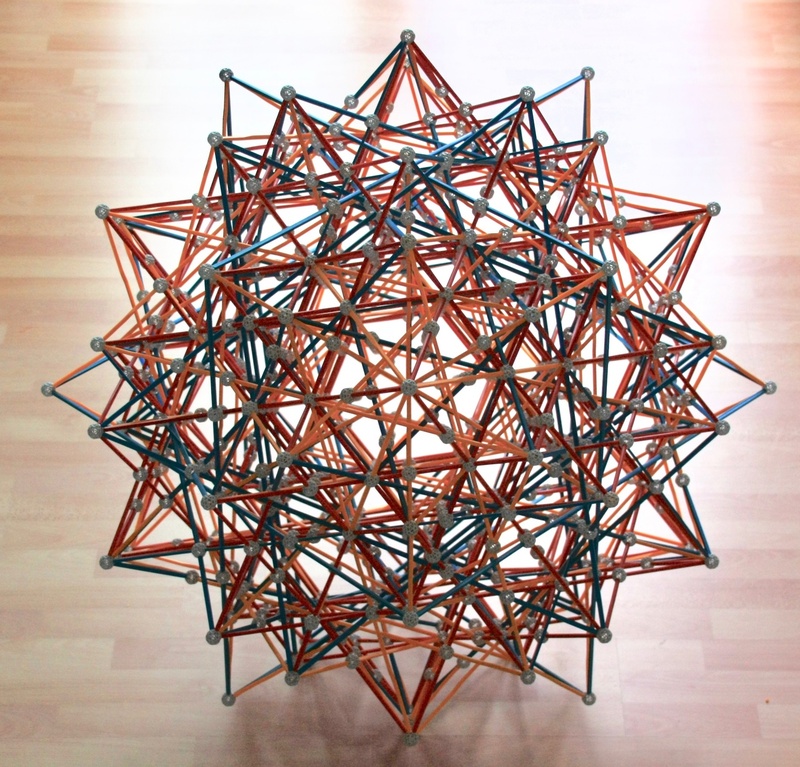 The 600 Tetrahedra of the 600-cell are here replaced by their rectifications, which are Octahedra. 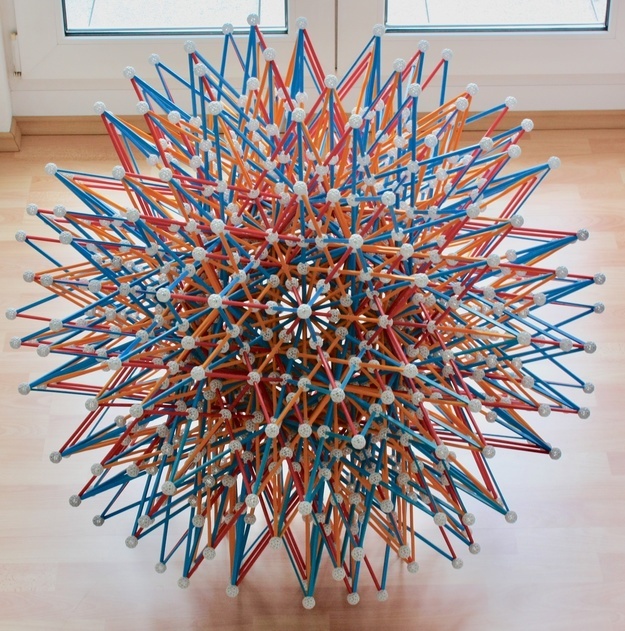 In the position of each of the 120 vertices of the 600-cell 120 Icosahedra (the vertex figure of the 600-cell) appeared. Because all cells are regular, this is the last of the three semi-regular polychora. You can see how this might be built from Zometool parts by looking at the Eusebeia page on the Rectified 600 cell. Also recommended is David Richter's page on the rectified 600-cell. This model is no longer in my office. Fig. 21: The icosidodecahedral cell-first projection of the Rectified 120-cell. 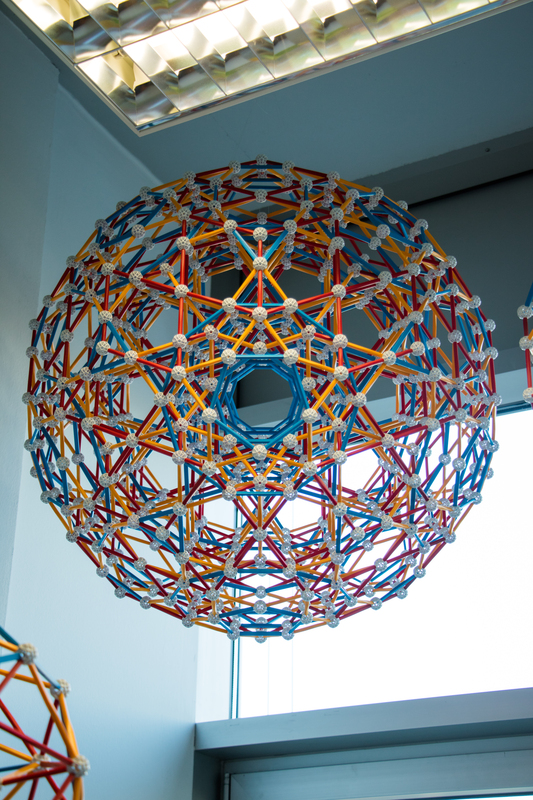 The Dodecahedra of the 120-cell are here replaced by their rectifications, Icosidodecahedra. 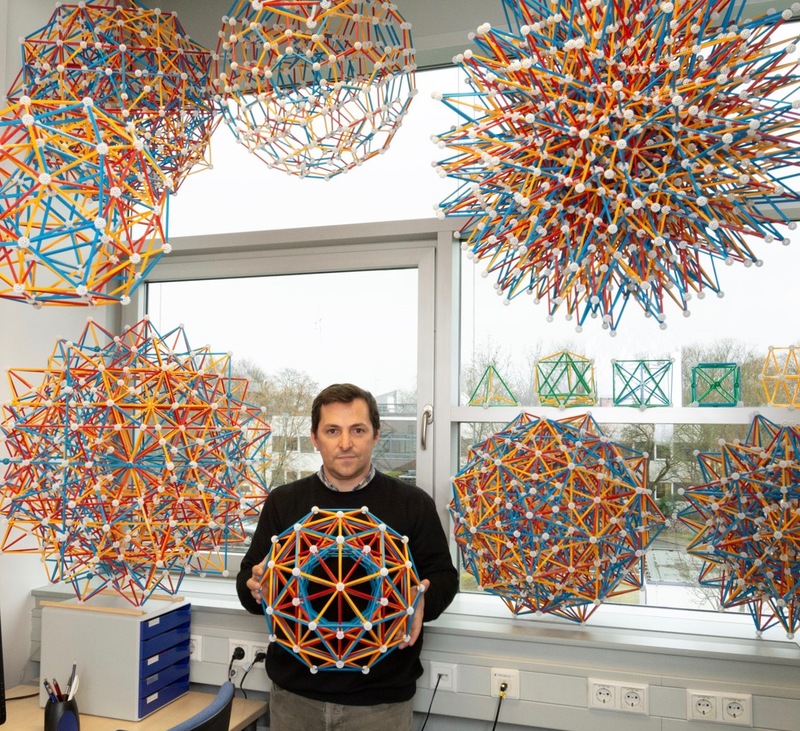 In the position of each of the 600 vertices of the 120-cell, 600 Tetrahedra (the vertex figure of the 120-cell) appeared. You can see how this might be built from Zometool parts by looking at the Eusebeia page on the Rectified 120 cell. This model is no longer in my office. The last 4 polychora have hexacosichoric symmetry. Fig. 22: Another diminished 600-cell, the Grand antiprism. 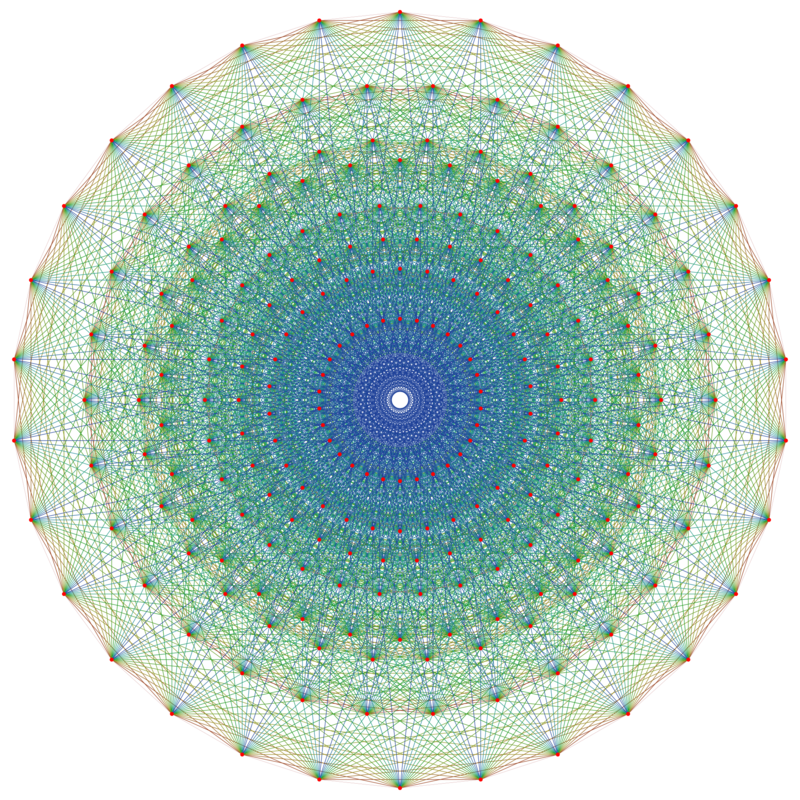 This was the last uniform convex polychoron to be discovered (in 1964) by John H. Conway and Michael Guy; they also proved that there are no more undiscovered uniform convex polychora. This is an anomalous uniform polychoron in the sense that, unlike all other polytopes discussed above, it has no Wythoffian construction. Its structure also helps understanding the structure of the 600-cell, in particular the fact that the latter can be decomposed in two disjoint perpendicular rings of 150 Tetrahedra each, separated by a Clifford torus of 100 Tetrahedra with the two sets of 100 Tetrahedra that border that torus on each side. In the Grand Antiprism, both tetrahedral rings have been removed and replaced with rings of 10 Pentagonal Antiprisms; in this model we're looking through one of these rings. 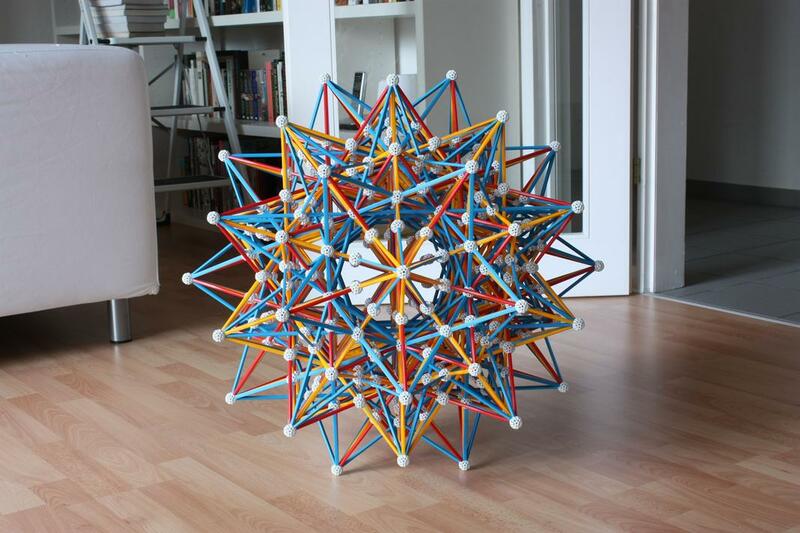 You can see how this might be built from Zometool parts by looking at the Eusebeia page on the Grand antiprism. Picture by Aris Noutsos. Linked picture by Jason Wu. It is important, before finishing, to note that although the models above include all the regular and ``semi-regular'' convex polychora, it includes only a small number of the convex uniform polychora. Some examples I have not built are in David Richter's list of convex uniform polytopes with pentachoric symmetry and his list of convex uniform polytopes with hexacosichoric symmetry. 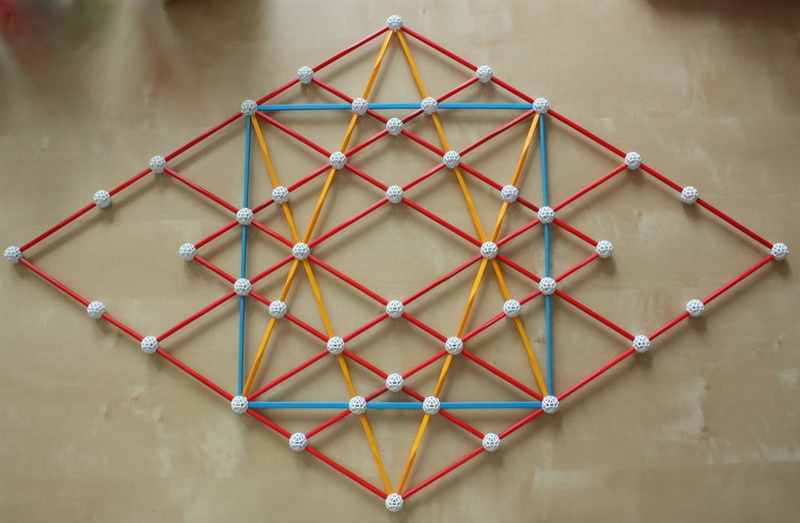 Many of the models based on the symmetry of the Tesseract and 24-cell cannot be built in Zometool because they require the construction of regular Octagons - which cannot be built in the Zometool system. We now move to the ten regular non-convex polychora, the Schläfli-Hess polychora. They all share the hexacosichoric symmetry of the 120-cell, 600-cell and their rectifications shown above. Their relations are depicted in Figures 26a and b below. Their cells and vertex figures can be read from Figure 32. In Fig, 26b, we can see that three of them (the Icosahedral 120-cell, the Grand 120-cell and the Great 120-cell) share the same edge arrangement of the 600-cell, i.e., they are analogues of the Great Dodecahedron, which has the edge arrangement of the Icosahedron. This implies that the Zometool model of the 600-cell shown in Fig. 18 also depicts the edge frames of their orthographic projections! Fig. 23a: This model represents the vertex-first projection of two other regular Schläfli-Hess polychora which share the same edge arrangement, the Small stellated 120-cell and the Great grand 120-cell (see instructions in David Richter's dedicated page). Fig. 23b: This is how it looks like in my office. Picture by Jason Wu. As shown in the caption to Fig. 23c (later in this page), this model also represents one of the two regular compounds of 25 24-cells and one of the two regular compounds of 75 Tesseracts. Fig. 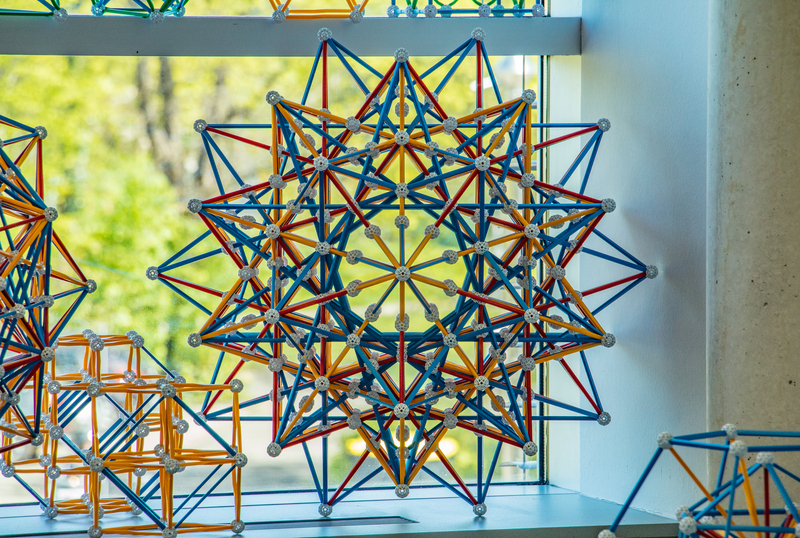 24a: This model represents the vertex-first projections of four Schläfli-Hess polychora that share the same edge arrangement: The Grand 600-cell, the Great stellated 120-cell, the Grand stellated 120 and the Great icosahedral 120-cell. Fig. 24b: This is how it looks like in my office. Picture by Jason Wu. 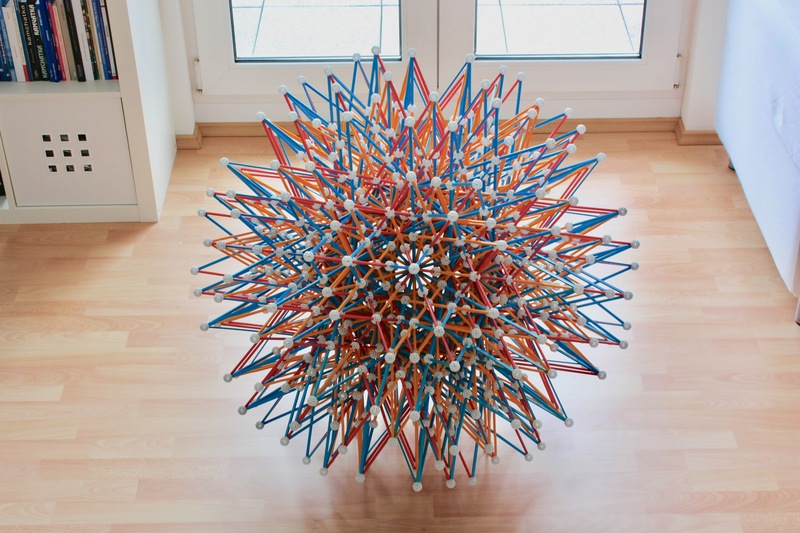 According to David Richter's page on this polytope, the edges in this model are images of the edges of the quasicrystalline projection of Gosset's eight-dimensional 421 polytope, the largest finite member of the k21 polytope family mentioned above. More about this family below. Fig. 25a: The last of the Schläfli-Hess polychora, the most complex of the 16 regular polychora, the final stellation of the 120-cell: The Great grand stellated 120-cell. Here it is seen from a 5-fold symmetry axis. Fig. 25b: Here seen from a 3-fold symmetry axis. 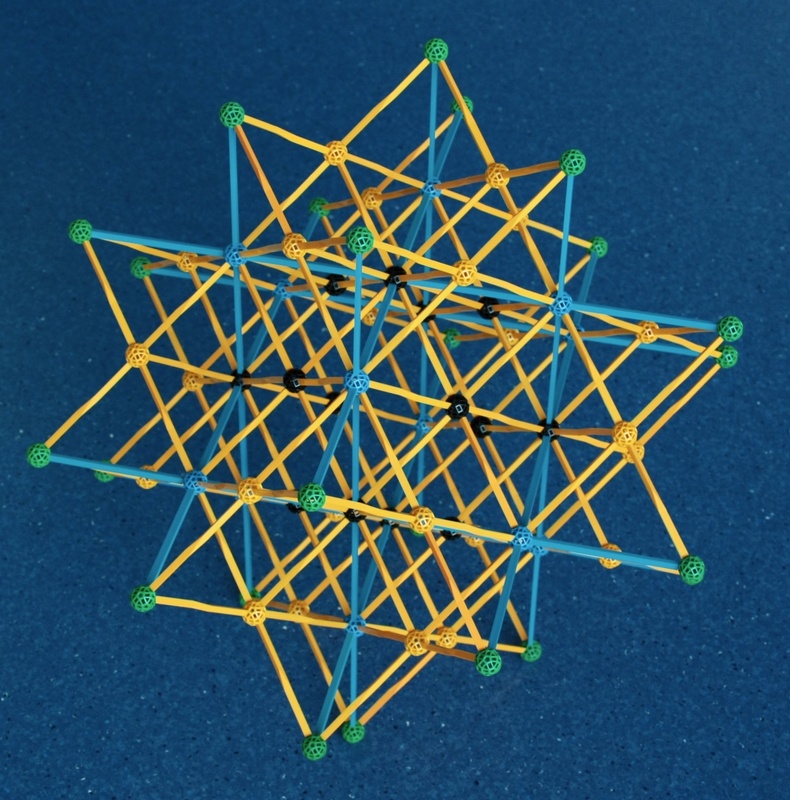 This model can use 20 very long yellow struts, no longer sold by Zometool (but easily found on eBay). These will be directly aligned with the 3-fold symmetry axis shown in this Figure. This saves 40 regular-sized struts and 20 balls and slightly improves the appearance of the model. See also David Richter's page on this model. With this model, the list of regular polychora is complete! Fig. 26a: Stellation relations between the 120-cell, 600-cell and the Schläfli-Hess polychora; these provide an explanation of their names. As in Fig. 5, the vertical scale indicates the density and the two-sided gold arrows denote duality; note that the Great 120-cell and the Grand stellated 120-cell are self-dual. To a cell in a polychoron corresponds a vertex in its dual (the line from the centre to the vertex is perpendicular to the 3-D plane of the cell), to a face in the polychoron corresponds a perpendicular edge in its dual going through the face's centre, to an edge in the polychoron corresponds a face in its dual in a perpendicular plane and to a vertex in the polychoron corresponds a cell in its dual. The dark blue arrows denote edge stellation, which has the same meaning as in 3-D. In the case of the 120-cell, this operation produces the Small stellated 120-cell. Each of the 120 Dodecahedra of the 120-cell was edge-stellated into a Small stellated dodecahedron (Fig. 4); the latter has only 12 vertices (one for each face of the Dodecahedron) arranged as in the Icosahedron. Likewise, the Small stellated 120-cell has only 120 vertices - one for each cell of the 120-cell, arranged as in the 600-cell. By the rules of duality, the dual polychoron, the Icosahedral 120-cell, will also have 120 cells and 120 vertices. The light blue arrows denote greatening; as in 3-D this means replacing a face by an identical, larger one in the same plane. Finally, the green arrows denote a new operation for polychora, aggrandizing (replacing cells by identical larger ones in the same 3-d ``plane''). Analogously to the 3-D case, none of these operations changes the number of cells or their 3-d ``planes''. Therefore, all stellations of the 120-cell (the polychora on the ``cubic'' chain starting on the 120-cell) must have 120 cells as well. As explained 2 paragraphs above, this is also true for the Icosahedral 120-cell, so it is also true for the latter's stellation, the Great icosahedral 120-cell. The Grand 600-cell is the only stellation of the 600-cell, so it is the only Schläfli-Hess polychoron with 600 cells. This makes it the 4-d equivalent of the Great Icosahedron in Fig. 4. Adapted from Conway, Burgiel and Goodman-Strauss (see references below). Fig. 26b: Faceting relations between the 120-cell, 600-cell and the Schläfli-Hess polychora. As in Fig.5 these operations can be seen as the duals of the stellation operations in Fig. 26a, i.e., they are like a mirror image of the latter. Since none of the stellation operations changes the number and hyperplane of the cells, all faceting operations preserve the vertex arrangements, as in 3 dimensions. Therefore, we see straight away that the eight polychora in the cubic chain starting on the 600-cell (the duals of eight polychora in the stellation chain of the 120-cell shown in Fig. 26a) have its vertex arrangement, i.e., they are all facetings of the 600-cell. As mentioned in Fig. 26a, this is also true for the Small stellated 120-cell, so its faceting, the Great grand 120-cell, must also have the vertex arrangement of the 600-cell. The Great grand stellated 120-cell, one of the many stellations of the 120-cell, is the only regular faceting of the 120-cell, i.e., it is the only Schläfli-Hess polychoron with 600 vertices. It is the dual of the Grand 600-cell, one of the many facetings of the 600-cell that is its only regular stellation. This makes the Great grand stellated 120-cell a 4-D analogue of the Great stellated dodecahedron (see Fig. 4), which it has as cells. We now describe the individual faceting operations. The solid red and gold lines are equivalent to: finding dual + edge stellating + finding dual. Since the edge stellation preserves the edge directions, the dual faceting operation preserves the face arrangements, which also imply the same edge arrangement. The polychora at the ends of these lines are not identical because their cells differ. The dashed lines are equivalent to find dual + greaten + find dual. Since greatening preserves the type of face and its plane, the dual faceting operation preserves the edge arrangement. Since Zometool models only depict edge arrangements, this conservation law is what defines how the polychora are represented: The 4 polychora in the red circuit can be depicted by the model of the 600-cell (Fig. 18), the 2 polychora in the purple line are depicted by the model of the Small stellated 120-cell (Figs. 23a and b) and the 4 polychora in the gold circuit can be depicted by the model of the Grand 600-cell (Figs. 24a and b). 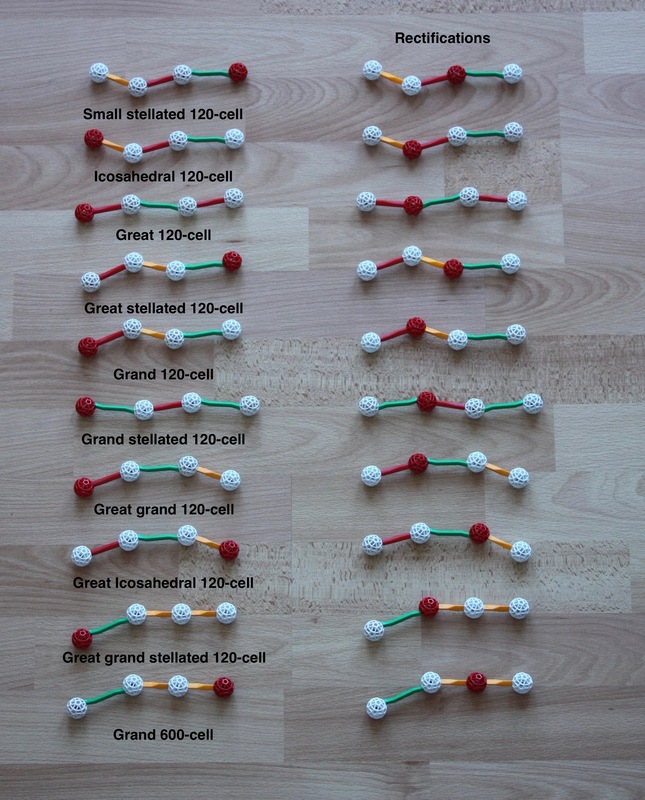 The Zometool models of the 120-cell (Fig. 19) and the Great grand stellated 120-cell (Figs 25a and b) depict only those polychora. The solid blue lines are equivalent to: find dual + aggrandize + find dual. Since aggrandizing preserves the cell type, the dual faceting operation preserves the vertex figure. The light blue lines show that each polychoron in the red family has a faceting in the yellow family with exactly the same vertex figure. The dark blue line shows that the only faceting of the 120-cell, the Great grand stellated 120-cell, also shares the former's vertex figure. 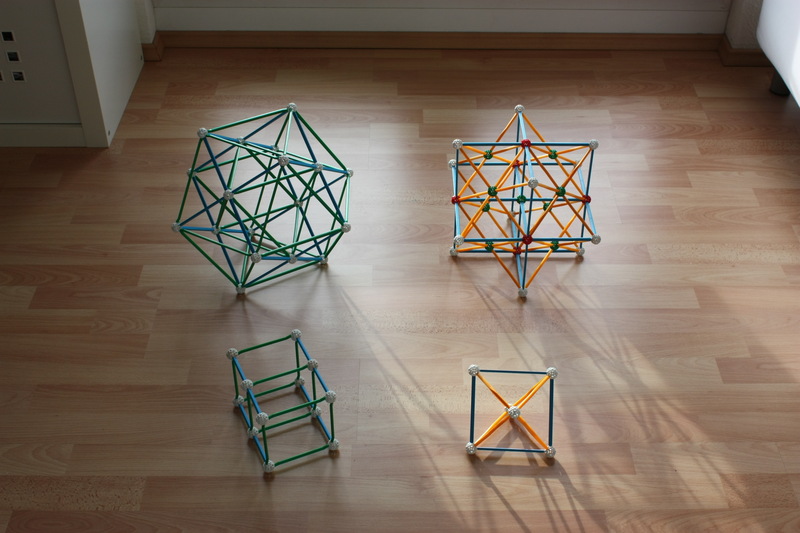 We present below Zometool models of the Coxeter-Dynkin diagrams for the polytopes shown above. 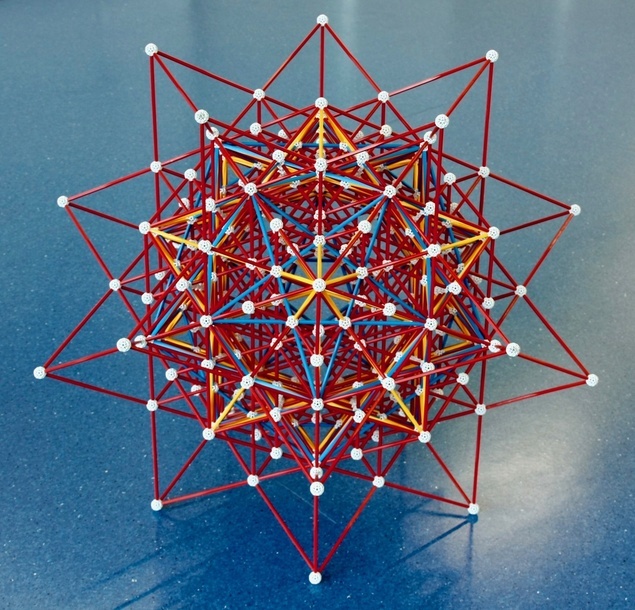 In the Zometool system, the yellow struts connect to the triangular holes in the connectors (the balls), they here represent the 3-symmetry branch in the C-D diagrams (which have no attached number because they are so common). 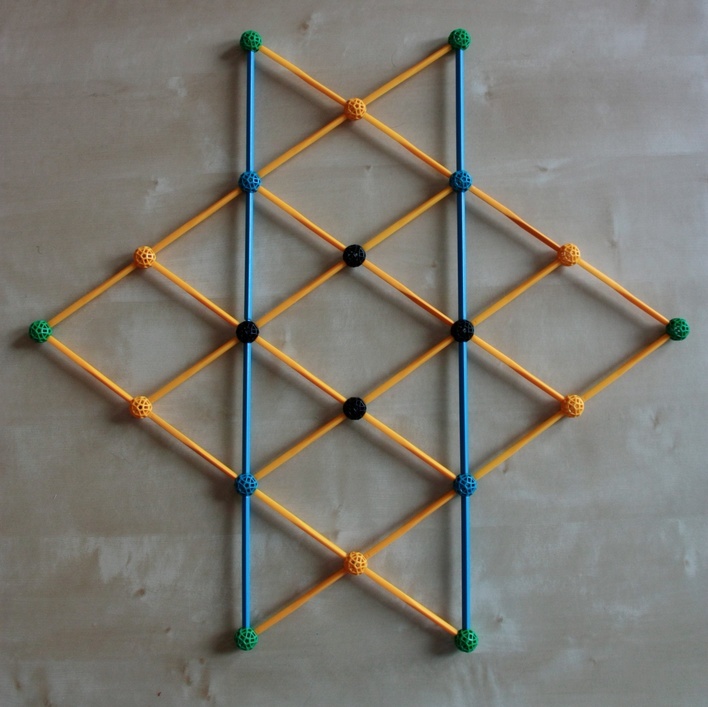 The blue struts connect to rectangular holes in the connectors, they represent the ``4'' branches in the C-D diagrams where they appear. The red struts connect to the pentagonal holes in the connectors, they represent the ``5''-branches in the C-D diagrams where they appear. The half-length green struts connect to the pentagonal holes, but they have a twist and are only half length of a regular green, for that reason they symbolize here the ``5/2''-branches in the C-D diagrams where they appear. The diagrams with only white balls represent a Coxeter group, which is akin to a set of mirrors in a Kaleidoscope. In the case of polyhedra, these can be thought as dividing a spherical surface in a set of identical Schwarz triangles. In the case of polychora, these can be thought as dividing a hyper-spherical surface in a set of identical Goursat tetrahedra. Identical diagrams with only red balls at opposite ends represent dual polytopes. Regular polytopes and their rectifications can then be thought as reflections of one of the vertices of these triangles/tetrahedra. This is the Kaleidoscopic Wythoff construction. The vertex is indicated by the opposite spherical node being represented by a red ball (in the C-D diagrams, this is represented by circling the node). Note that many polytopes can be represented by multiple C-D diagrams. Fig. 27: These are the C-D diagrams of the regular polygons used in the polychora above, plus their generating groups. All these graphs are left-right symmetric, this means that all regular polygons are self-dual. The number of such diagrams is, of course, infinite. Fig. 28: These are the C-D diagrams of the regular and quasi-regular polyhedra displayed above, plus their generating groups. On the left column we have the graphs for the groups, in the middle column we have the convex polyhedra, and in the right column we have the star polyhedra. These diagrams include the polygonal diagrams in Fig. 27, such polygons are thus a part of the polyhedron. For instance, for the Cube, the only polygon graph that can be built with the red ball is the Square. However, for the Icosidodecahedron, we can form the graphs of the Pentagon and the Equilateral triangle with the red ball (since the graph can be read in both directions); thus the polyhedron is bound by both types of polygons. Two neighbouring white nodes indicate a regular vertex figure: from this, we can see immediately that the vertex figure of the Cube is a regular triangle. At the start of the page we said that regular and quasi-regular polyhedra share the same Kaleidoscopic Wythoff construction. This fact is evident in the C-D diagrams by the fact that all polyhedron graphs have only one red ball, i.e., they are reflections of vertices of their Schwarz triangles. Other Wythoff constructions, which reflect points in the edges or even faces of the Schwarz triangles to create many uniform polyhedra, would require more than one red ball. An important point to re-emphasize is that a particular polyhedron (like the Octahedron) can be represented by different diagrams. This is a reflection of the fact that the same polyhedron can be produced from different symmetries. These polyhedra have several other C-D diagrams, we present here those where only one red ball is needed; which directly implies regularity or quasi-regularity. The A3 graph is symmetric, therefore the Tetrahedron can be generated with the red ball at either end. This means that the Tetrahedron is delf-dual. Fig. 29: These are the C-D diagrams of the convex polychora presented above, plus their generating groups. On the left we have most of the group graphs. In the middle we have the convex polychora displayed above. These include as sub-sets the polyhedral graphs in the middle column of Fig. 28. 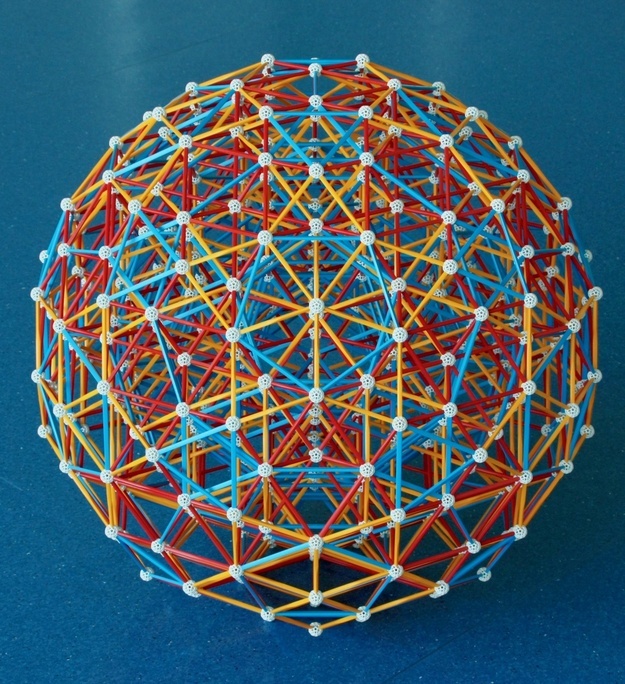 For instance, in the 16-cell, the only polyhedral graph that can be built with the red ball is the Tetrahedron, therefore the 16-cell only has Tetrahedra, and is therefore regular. In the case of the rectified 5-cell, however, we can build the graphs of the Octahedron and the Tetrahedron from the red ball; this means that that polychoron is bound by both types of polyhedra. Three neighbouring white nodes indicate a regular vertex figure (which happens, of course, only for regular polychora), with the equivalent of the red ball next to the actual red ball. Doing this for the 600-cell, for instance, we see that the vertex figure is an Icosahedron. Most (but, unlike in Fig. 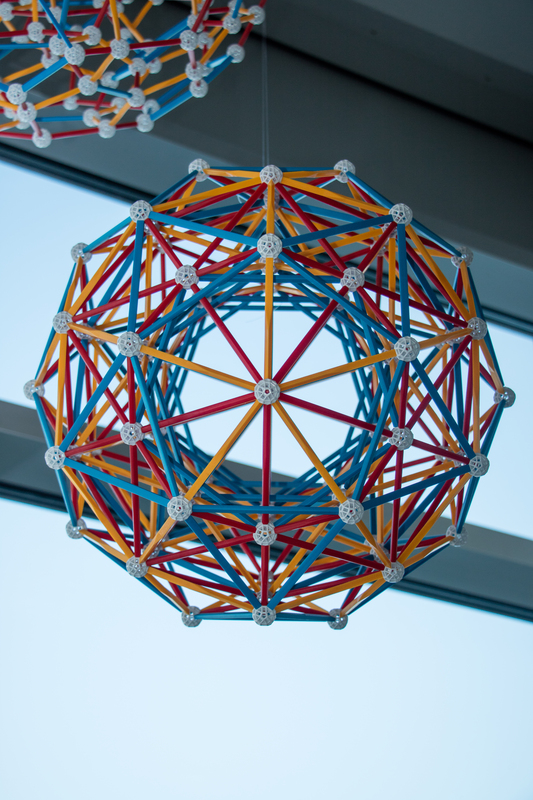 28, not all) of the polytope graphs presented here have the same Wythoff construction, i.e., they have one red ball. The exceptions are the diminished 600-cells: the Snub 24-cell (see Fig. 17), which has two green balls (indicating rotational but not reflexive symmetry) and the Grand antiprism. The latter does not appear in this Figure because (as mentioned in the caption to Fig. 22) it has no Wythoff construction. 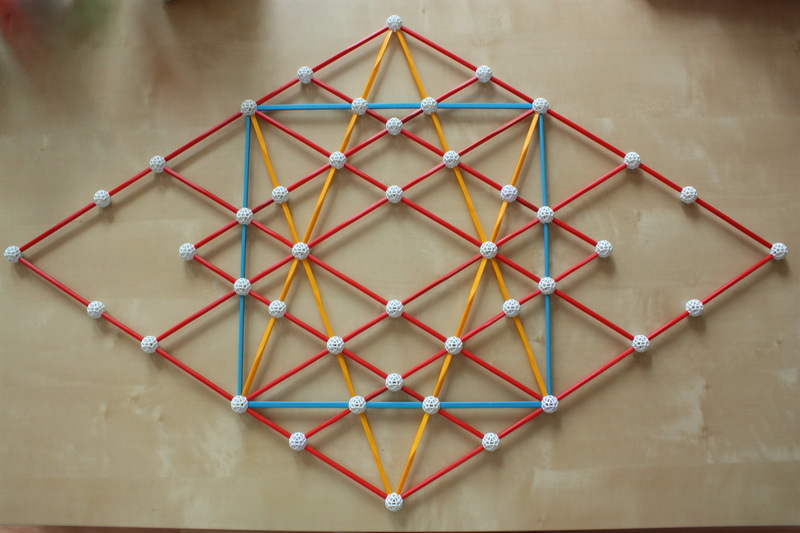 Many other convex uniform polychora are possible with the use of more red balls, but building all of them requires many parts, as one can see in David Richter's H4 page. Studying these diagrams, we can see that the process of rectification of a regular polychoron with X-type of cell and Y-type of vertex figure generates a new polychoron for which the cells are rectified Xs (as many as the previous number of cells) and Ys (as many as the previous number of vertices). The number of vertices will be the same as the number of edges in the polychoron before. Again, almost all of these polychora can be represented by multiple C-D diagrams; those presented here are those that require only one red ball. Note that the 24-cell is represented by 3 different diagrams in the figure, and the 16-cell by two. Some of these extra diagrams appear in the right column, we have, on top, the Demi-hypercubic group D4. In 4 dimensions, this type of symmetry does not yet produce new polytopes, this starts happening only in 5 dimensions. However, it has some interesting consequences, one of them being Triality. This concept deserves a detailed explanation. In the case of duality in 3 dimensions, one can, by the definition of the meaning of duality, scale two concentric dual polyhedra in such a way that each edge from a polyhedron meets another (perpendicular) edge from the dual polyhedron at a point that is in the middle of both (the midpoint). Those two edges form a plane that is perpendicular to a third line joining the midpoint to the centre of those polyhedra. Rectifying those two dual polyhedra results in the same rectified polyhedron. In the case of Triality in 4 dimensions, the situation is very similar, except that the perpendicular edges of three concentric ``trial'' polychora (16-cells for the only regular case) meet at their midpoints. These edges are in a 3-D ``plane'' that is itself perpendicular to a fourth direction, the line joining those midpoints to the centres of the trial polychora. Rectifying all three polychora results in the same rectified polychoron, the regular case being the 24-cell. The same applies to projections: if we pick three ``trial'' projections of the 16-cell and rectify them, we obtain an invariant projection of the 24-cell. In this page, we show a triad of such trialities. The first we met already in Figs. 15a and 15b, triality is the reason for the identical rectifications of the vertex-first and cell-first projections of the 16-cell. The other two are shown in Figs. 30a and 30b. This shows the predictive power of the C-D graphs. Fig. 30a: Three edge-first projections of the 16-cell, with the central edges of the projections loosely aligned along 3 perpendicular orthogonal axes in 3-d space. Rectifying all three projections results in the same projection of the 24-cell, which is shown in the centre. This is its the vertex-first (or ``pyritohedric'') projection, the dual of the cell-first projection in Figs. 15a, 15b, 16 and 31a. Fig. 30b: The three ``prismatic'' projections of the 16-cell. Rectifying all three projections results in the same projection of the 24-cell, also known as its ``prismatic'' projection, this is shown in the centre. One of the beauties of this model is that it shows all vertices, edges, faces and cells separately, whithout superpositions. 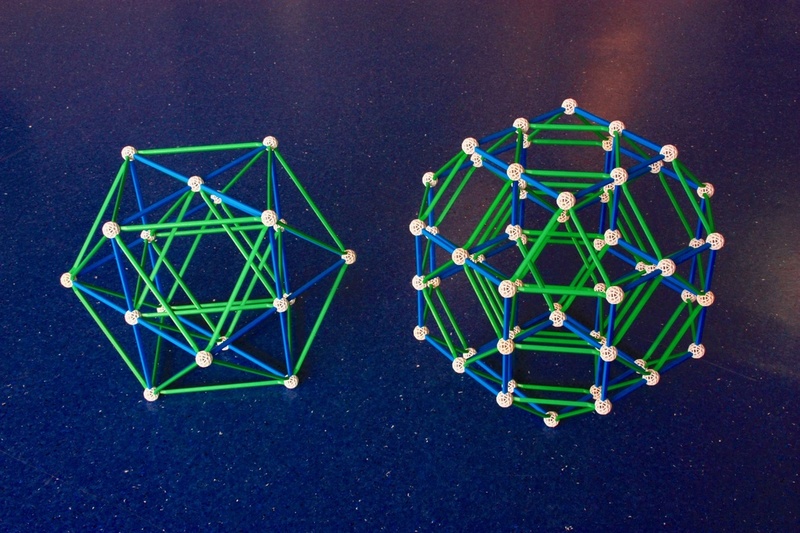 For a detailed explanation of these models, see David Richter's Triality with Zometool page. Fig. 31: These are the C-D diagrams of the Schläfli-Hess polychora presented above (on the left column), plus those of their rectifications (on the right column). I have built models for all polychora on the left, but not for their rectifications (for lack of space, time and money...), except for one or two (see below). 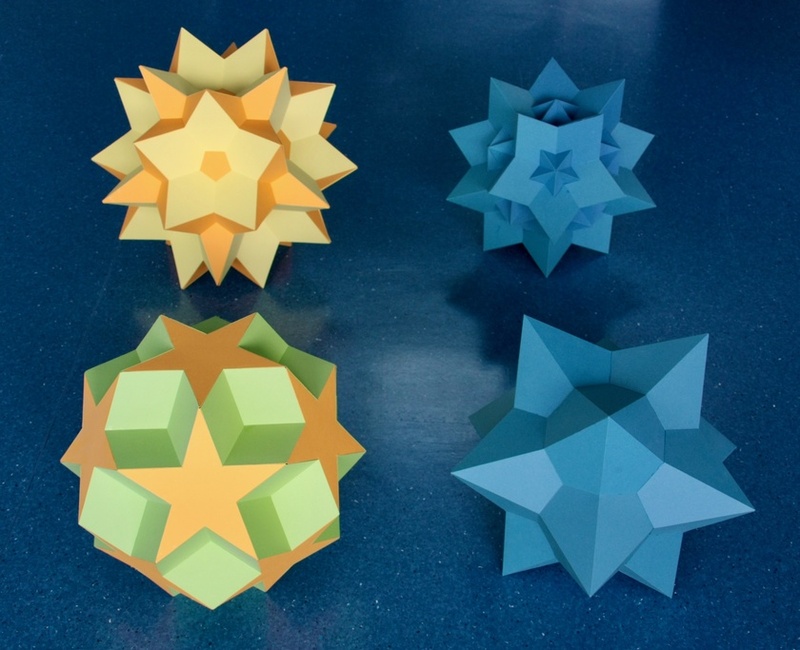 These also include the star polyhedra diagrams in the right column of Fig. 28. From these diagrams, we can see, for instance, that the Small stellated 120-cell is bound by Small stellated dodecahedron cells (the only polyhedral graph that can be built from the red ball) and that this has a Dodecahedral vertex figure. Thus its dual, the Icosahedral 120-cell, has Icosahedra as cells, and Great dodecahedra as vertex figures. We can also see that, following the logic of rectification, the Rectified small stellated 120-cell has Dodecadodecahedra and Dodecahedra as cells, and that the Rectified icosahedral 120-cell has Icosidodecahedra and Great dodecahedra as cells. Note that the edges of the latter rectified polychoron are identical to those of the Rectified 600-cell (Fig. 20); thus both can be represented by the same Zometool model. The identical rectification is a consequence of the conservation laws in Fig. 26b: the rectifications of two polytopes that share the same edge arrangement will necessarily share the same vertex arrangement, since the vertex of the rectification is the middle point of the edge of the original polytope. The rectifications of two polytopes that additionally share the same face arrangement (like the 600-cell and the Icosahedral 120-cell) will necessarily share the same edge arrangement. The symmetry of graphs for the Great 120-cell and the Grand-stellated 120-cell indicates that these are, as remarked above, self-dual. 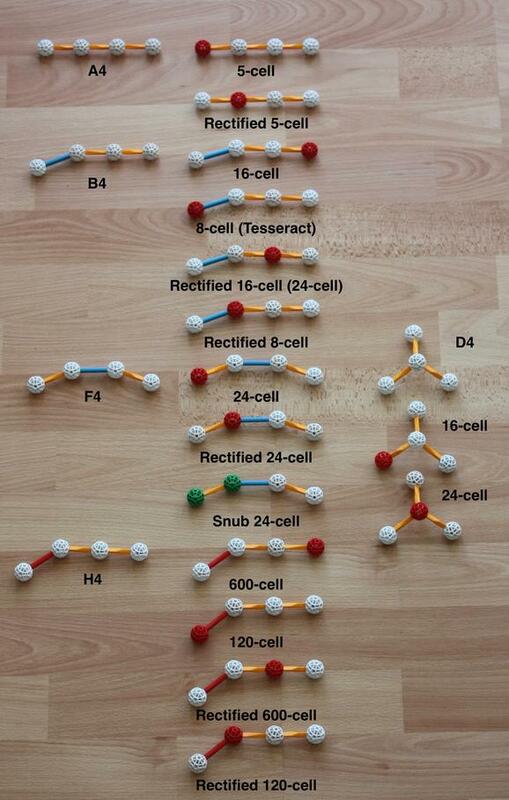 The models below show some of the regular polychoron compounds. As in the case of the regular polyhedron compounds, these can be seen as important facetings of the regular polytopes. They also illustrate the fact that some of the polychoron symmetry groups are sub-groups of others. The concept of triality described above allows a better understanding of the first object we discuss below, the compound of three 16-cells. We present three projections of this compound, which result directly from stellating (and/or faceting) the three projections of the 24-cell in Figs. 16, 30a and 30b. Fig. 32a: Superposing the 3 orthogonal 16-cells in Fig. 30a, we obtain, on top right, a regular polychoron compound of three 16-cells. This is the first stellation of the 24-cell; this particular projection results from stellating the pyritohedric projection of the 24-cell. Since the latter has the Rhombic dodecahedron as its outer surface, this projection has, as its outer surface, the first stellation of the Rhombic dodecahedron; the latter is also known as ``Escher's polyhedron''. 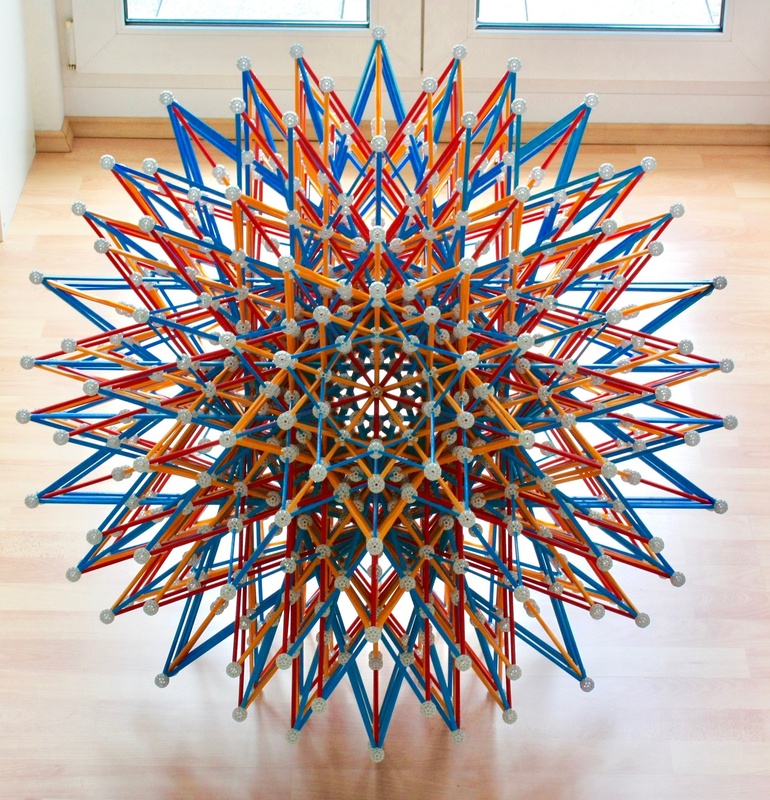 Each of the individual Octahedra of the 24-cell was stellated into a ``Stella Octangula'', which has two Tetrahedra. Therefore, the compound of three 16-cells can also be seen as a compound of 24 ``Stella Octangula'', with a total of 48 Tetrahedral cells. The green balls in this model represent false vertices (where 3 edges from 3 different 16-cells intersect in the middle - remember the triality! ), the red balls superpositions of false and real vertices, and the white balls are real vertices. These ``false'' vertices are the real vertices of the rectification of these 16-cells - the pyritohedric projection of the 24-cell in Fig. 30a. The real vertices have the same vertex arrangement of a larger, cell-first projection of the 24-cell seen on the top left - this is the dual of the projection of the pyritohedric 24-cell. This is a consequence of the fact mentioned in the caption of Fig. 16 that the vertices of three 16-cells make the vertices of a 24-cell. The dual of the edge-first projection of the 16-cell (lower right) is the face-first projection of the Tesseract (lower left). This means that the dual of the projection of the compound of three 16-cells shown above must be another regular compound, with three (face-first) tesseracts. Amazingly, that regular compound is well represented by the model of the 24-cell above left: each of its vertices belongs to two Tesseracts, and both the vertex and edge arrangements are identical to that of the cell-first projection of the 24-cell. 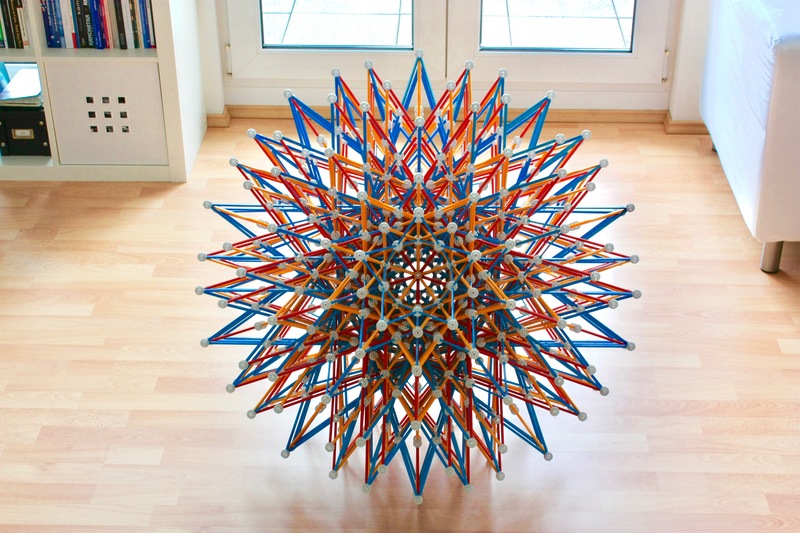 With some attention, you might discern the 3 face-first Tesseracts in that model. Note that combining these projections of the 16-cell and Tesseract, we obtain a compound with the same (real) vertices of both models above, but a mix of edges. Fig. 32b: Combining one vertex-first projection of the 16-cell in Fig. 15a with two complementary superposed cell-first projections of the 16-cell in Fig. 15b, one obtains, on the left, a different projection of the compound of three 16-cells. This projection is the stellation of the cell-first projection of the 24-cell; since the latter has a Cuboctahedral envelope; its stellation's envelope must be a composite of a Cube and a Octahedron. The real vertices (the white balls) have the same vertex arrangement of the pyritohedric projection of the 24-cell (on the right) and of course the false vertices (in red) are the same as the cell-first projection of the 24-cell in Fig. 31a. The dual of this projection of the compound of three 16-cells is the projection of the compound of three Tesseracts, also on the right, which looks exactly like the pyritohedric projection of the 24-cell. Indeed, we can see that this model looks exactly like a superposition of the projections of the Tesseract in Figs. 15a and 15b. Fig. 32c: Combining the three prismatic projections of the 16-cell in Fig. 30b one obtains, on the right, the prismatic projection of the compound of three 16-cells. The false vertices (in green) have the same arrangement as the vertices of the prismatic projection of the 24-cell shown on the left. Through each of the false green vertices goes a single edge of all three projections of the 16-cell in figure 30b. This shows that the prismatic projection of the 24-cell on the left really is the rectification of those three projections of the 16-cell. Furthermore, this also shows that this projection of the compound of three 16-cells is the stellation of the prismatic projection of the 24-cell. The red balls are edge intersections that appear because of the projection; they are not real edge intersections in 4 dimensions. 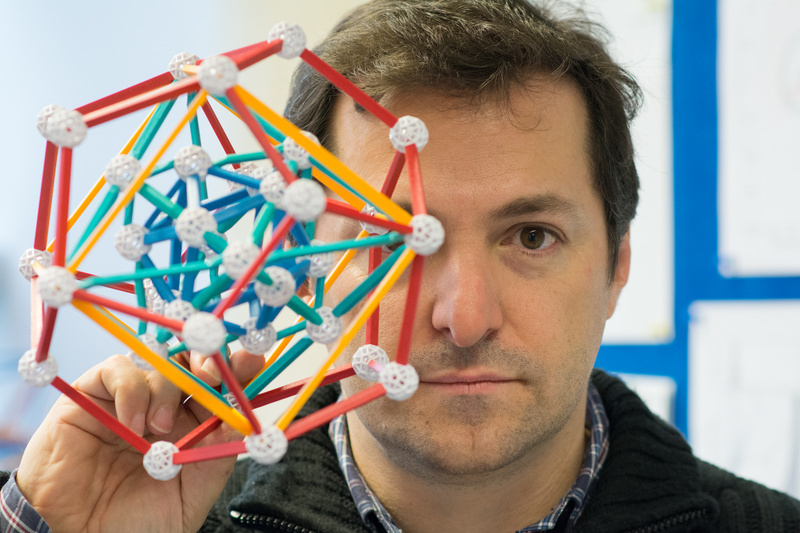 The real vertices of the compound of three 16-cells (white balls) have the same arrangement of the dual of the prismatic projection of the 24-cell, a projection of the 24-cell that cannot be built in the Zometool system. For more details on this projection of the compound of three 16-cells, check David Richter's dedicated page. One of the advantages of the prismatic projection of the compound of three 16-cells is that is shows all 48 real and false vertices of the compound separately - no superposed vertices here. All edges, faces and cells are also shown in the model. The vertex arrangement of the dual configuration of 24-cells represents the 48 root vectors of the F4 group. Like the 24-cell, this is a truly exceptional object. Fig. 33a: With five 24-cells (one in pyritohedric projection, as in Fig. 30a, and four in prismatic projection, as in Fig. 30b, all built on a φ2 larger scale), we obtain a self-dual regular polychoron compound. In this picture, we're looking at its 3-d projection through a genuine three-fold symmetry axis. This compound has 5 × 24 = 120 vertices, which happen to have the same arrangement as the 120 vertices of the 600-cell in Fig. 18, which implies that this compound is a faceting of the 600-cell. This illustrates the fact mentioned in the caption of that figure that the vertices of the 600-cell can be decomposed in five sets, each with the same arrangement as the vertices of a 24-cell. The edges of this model are a sub-set of the edges of the Small stellated 120-cell in Figs. 23a and 23b. Fig. 33b: The regular compound of five 24-cells, now seen through a five-fold ``Ghost symmetry'' axis. Note that since the edges and vertices of the compound of three Tesseracts coincide with those of a 24-cell, the model above also represents another regular compound, one with 15 Tesseracts, also a faceting of the 600-cell. In that case, each of the 120 vertices is shared by two Tesseracts, instead of one 24-cell. See detailed explanation of this model in David Richter's dedicated page, which includes a part count. 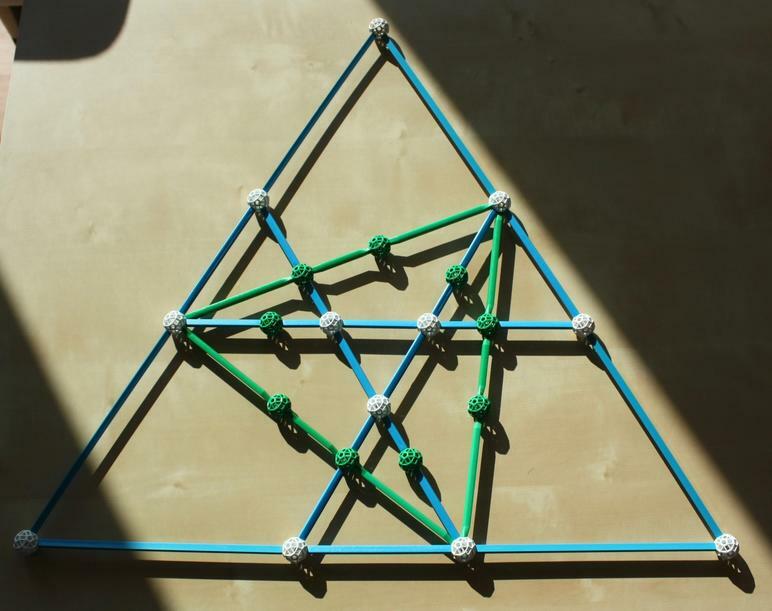 Here we're building this model on a φ smaller scale than the model in David Richter's page. This has an interesting implication: If we can find some of the very long old struts no longer manufactured by Zometool (12 very long reds, 12 very long yellows), we can use each of them to replace a combination of two struts and one ball where the ball is not strictly necessary (i.e., a ball where thers is no intersection with other edges). Doing this, we can save 48 regular-sized struts and 24 balls compared to the part count in David Richter's page, and improve the appearance of the model. Fig. 34a: Combining the pyritohedric projection of the compound of 3 16-cells (in Fig. 32a) with four prismatic projections of the compound of 3 16-cells (in Fig. 32c), all built on a φ2 larger scale than in those figures, we obtain the dual of the compound of 15 Tesseracts in Figs. 33a and b, the (also regular) compound of fifteen 16-cells. This is also the stellation of the compound of five 24-cells in Figs. 33a and b. Here we see it through the 3-fold symmetry axis. The 15 × 8 = 120 vertices are also those of a 600-cell, which implies that this is also a faceting of the 600-cell. Interestingly, in this projection they are not arranged as the vertices of the projection of the 600-cell in Fig. 18, but as a sub-set of the 600 vertices of the 120-cell in Fig. 19. This compound can also be seen as a compound of 120 ``Stella Octangula''. Fig. 34b: The compound of 15 16-cells, here seen through a 5-fold ``ghost symmetry'' axis. See also David Richter's dedicated page, which has a detailed description and part count. As in the model of the compound of 5 24-cells, if we can find some of the very long old struts (in this case, 48 very long reds, 120 very long yellows and 72 very long blues), we can save 480 regular-sized struts and 240 balls compared to the part count in David Richter's page, and greatly improve the appearance of the model. Fig. 33c: Rectifying the compound of 15 16-cells, we produce three superposed copies of the compound of 5 24-cells. As in Fig. 33b, we're looking at the model through one of its ghost symmetry axes. However, in this photo the strut colors are not as obvious, so the model resembles even more the model of the Small stellated 120-cell in Figs. 23a and 23b. Fig. 23c: This is another regular compound, one of the pair of dual compounds that has 25 24-cells. In this compound the 600 vertices still have the same arrangement as the 600-cell; i.e., they appear in 120 unique points, with each point representing the vertices of five different 24-cells. This implies that this compound is also a faceting of the 600-cell. The 96 × 25 = 2400 edges will twice cover be the full set of 1200 edges of the Small stellated 120-cell, i.e., each edge of the Small stellated 120-cell is shared by two 24-cells. Thus the Zometool model of this compound of 25 24-cells is also the model of the Small stellated 120-cell in Figs. 23a and 23b! Again, because the edges and vertices of the compound of three Tesseracts coincide with those of a 24-cell (with each vertex shared by two Tesseracts), this model has the same vertices and edges as one of the two regular compounds of 75 Tesseracts! 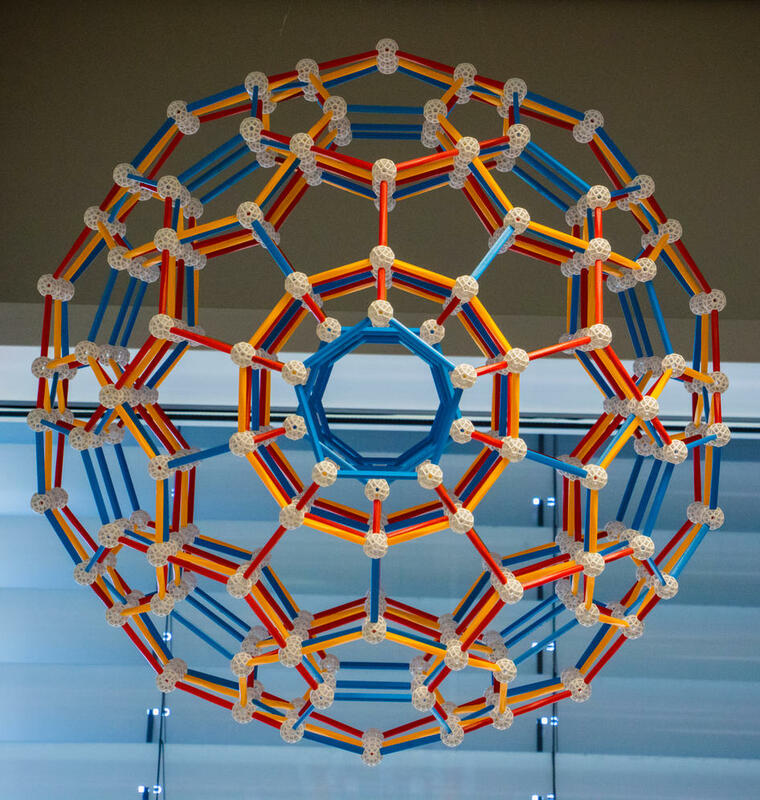 This means that this model also represents one of these compounds of 75 Tesseracts, the one where each of the 120 vertices (arranged as those of the 600-cell, of which the compound must be a faceting) is shared by 10 Tesseracts. Three different projections of the compound of 3 16-cells (Figs. 32a, b and c). These are at the same time facetings and stellations of the 24-cell. Three different projections of the compound of 3 Tesseracts (identical to the three projections of the 24-cell in Figs. 32a, b and c). This is the dual of the compound of 3 16-cells. Also a faceting and a stellation of the 24-cell. The self-dual compound of 5 24-cells (Figs. 33a, b and c), a faceting of the 600-cell. The compound of 15 Tesseracts (identical to model of the compound of 5 24-cells in Figs. 33a, b and c), also a faceting of the 600-cell. The compound of 15 16-cells (see Figs. 34a and b), another faceting of the 600-cell, this is the dual of the previous compound of 15 Tesseracts and a stellation of the compound of 5 24-cells. One of the two dual compounds of 25 24-cells (identical to the model of the Small stellated 120-cell, see Fig. 23c), this one also faceting of the 600-cell. One of the two compounds of 75 Tesseracts (identical to the model of the compound of 25 24-cells, see also Fig. 23c), this one also a faceting of the 600-cell. 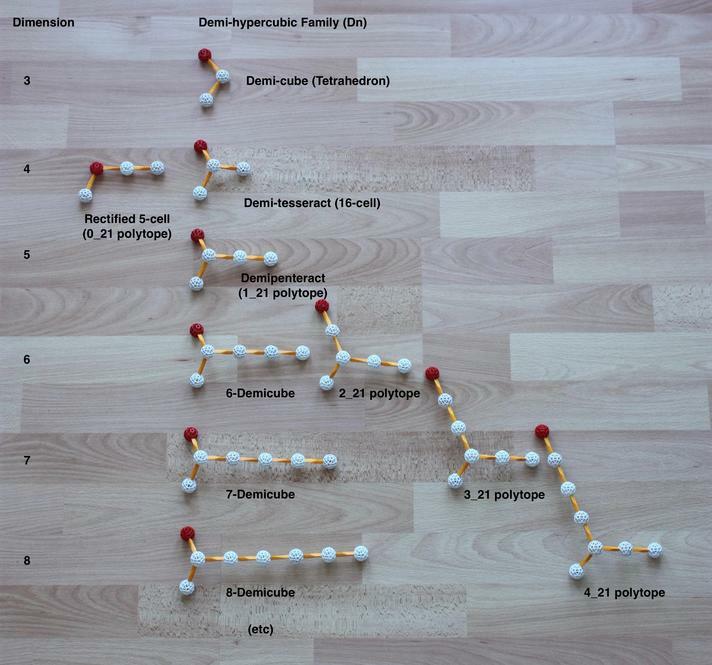 This is by no means the whole list: there are, in total, 32 regular polychoron compounds. The nice thing about this list, though, is that, together with nine of the 10 non-convex regular polychora, it completes all facetings of the 600 cell! (one of the facetings of the 600-cell, the compound of 75 16-cells, is very similar to the compound of 15 cells, in the same way that the compound of five Tetrahedra is similar to the compound of ten Tetrahedra: the first already covers the vertices uniquely). 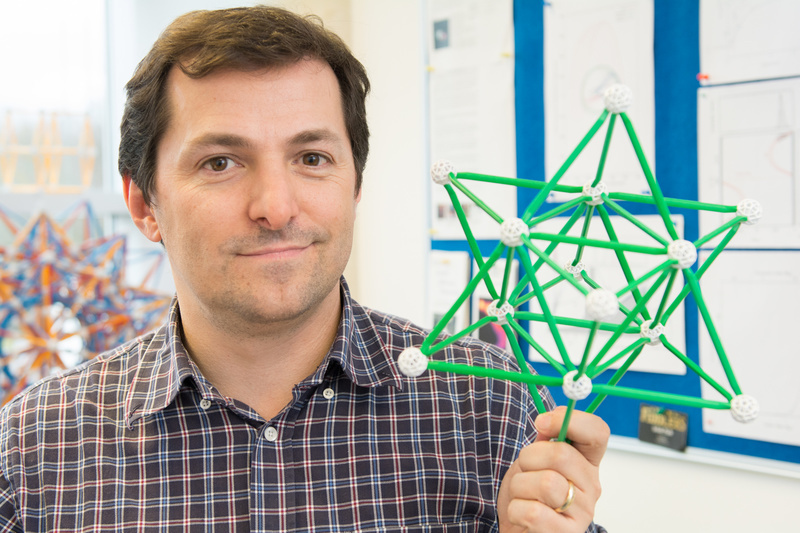 Some of the other compounds can also be built with Zometool. One example is one of the two compounds of 75 16-cells (see David Richter's page on that compound). This can be obtained from the compound of 15 16-cells using the same method we used to derive the compound of 25 24-cells from the compound of 5 24-cells: make 4 more copies and rotate them around the ghost symmetry axis. Therefore looking at the projection of the compound of 75 16-cells from its real 5-fold symmetry axis will be similar to the view of the projection of the compound of 15 16-cells along its ghost symmetry axis (shown in Fig. 34b). Unlike most compound models we have shown above, that latter is a faceting of the 120-cell. I might do that model some other time. It is clear, however, that my office won't have the space for all those models. What happens at dimensions higher than 4? The only regular polytopes are the Simplexes (generated by the An groups, where n is the dimension number), the Hypercubes and their duals, the Orthoplexes, or cross polytopes, generated by the Bn groups. These An and Bn group families are infinite, extending to any number of dimensions. Apart from them, there are no equivalents of Icosahedra, there are no regular star polyhedra either. However, there is an infinite family of uniform polytopes that has been thus far hidden: the Demi-hypercubes, generated by the Dn group family. These are obtained by removing alternate vertices of a Hypercube. It has been hidden because all polyhedra and polychora built with the symmetry of the Demi-cube and Demi-tesseract already exist as members of other families: the Demi-cube is the Tetrahedron and the Demi-tesseract is the 16-cell. Although the symmetry has some interesting consequences in 4 dimensions, like Triality, it is only in 5 dimensions that it starts generating new polytopes (through the Wythoff construction) that are unique to it. One of these is the semi-regular Demipenteract, see Fig. 35. Fig. 35: C-D diagrams for some of the higher-dimensional polytopes. In the centre we see the infinite Demi-hypercubic family. All polytopes of this family in 3 and 4 dimensions are also generated by the B3 and B4 groups. In 5 dimensions, the D5 family starts generating unique symmetries that are not present in the An or Bn families. We also see the k21 family evolving along the diagonal. This ends at 8 dimensions, with the 421 polytope. The next member of the family is an infinite tesselation filling 8-dimensional space. The Demipenteract is interesting because, as we can see in Fig. 35, it also belongs to the finite semi-regular k21 polytope family (the name comes from the length of the branches in the C-D diagrams, with the k indicating the length of the branch where the red ball is). In this family the facets of each polytope are Simplexes and Orthoplexes and the vertex figure given by the (k-1)21 polytope below it. In that family the Demipenteract is the 121 polytope. Its vertex figure is the 021 polytope; as discussed above, this is the rectified 5-cell (see Fig. 15a). In 6 dimensions, the k21 family starts generating polytopes with symmetries unique to it. Of particular interest is the 221 semi-regular polytope. This and 38 other uniform polytopes are constructed within the symmetry of the E6 group. In seven dimensions, the semi-regular 321 polytope and 126 other uniform polytopes are constructed within the symmetry of the E7 group. Finally, in eight dimensions, the semi-regular 421 polytope (see Figures 36 and 37 below) and 254 other uniform polytopes are constructed within the symmetry of the E8 group. 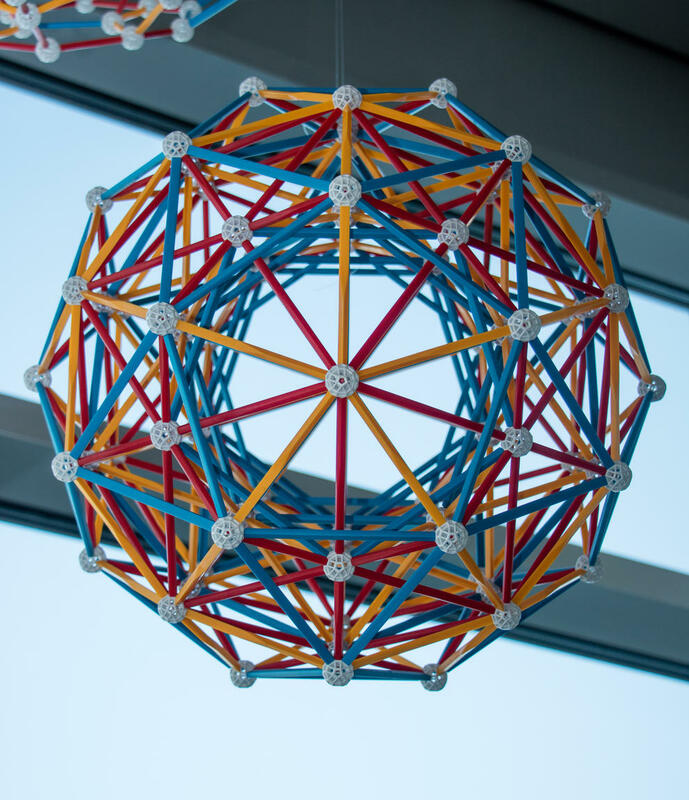 The largest of these, the Omnitruncated 421 polytope, has 696,729,600 vertices, the number of symmetries of this group. That's it! The family ends, because its next member (still in eight dimensions!) is the infinite 521 honeycomb. Its vertex figure is the E8 polytope and its vertex arrangement is the E8 lattice; this provides the most compact sphere packing in 8 dimensions. In 8-dimensional space, each hypersphere can ``kiss'' 240 other hyperspheres (note that 240 is the number of vertices of the 421 polytope). Fig. 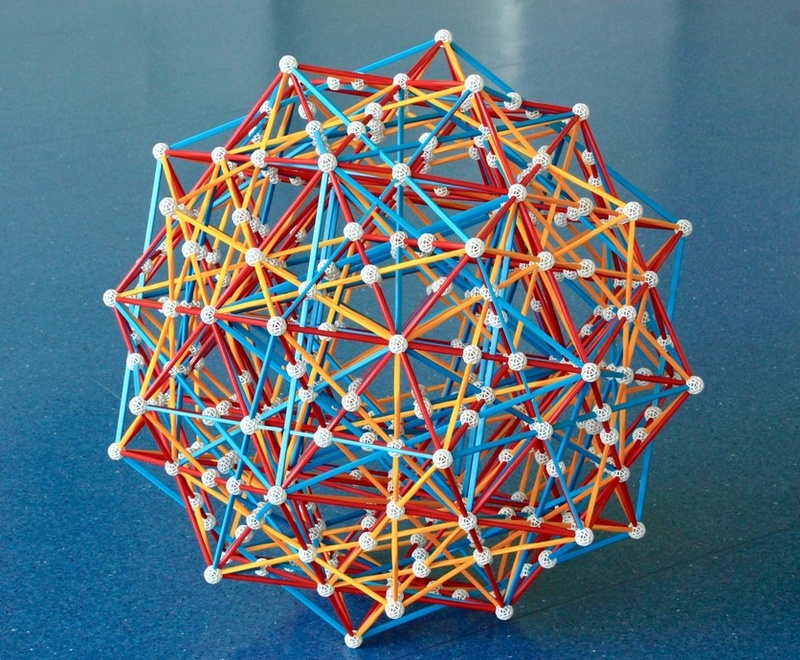 36: A Zometool model of the 421 polytope. The 240 vertices project here as the vertices of two concentric 600-cells, with one of them being larger than the other by a factort of φ. 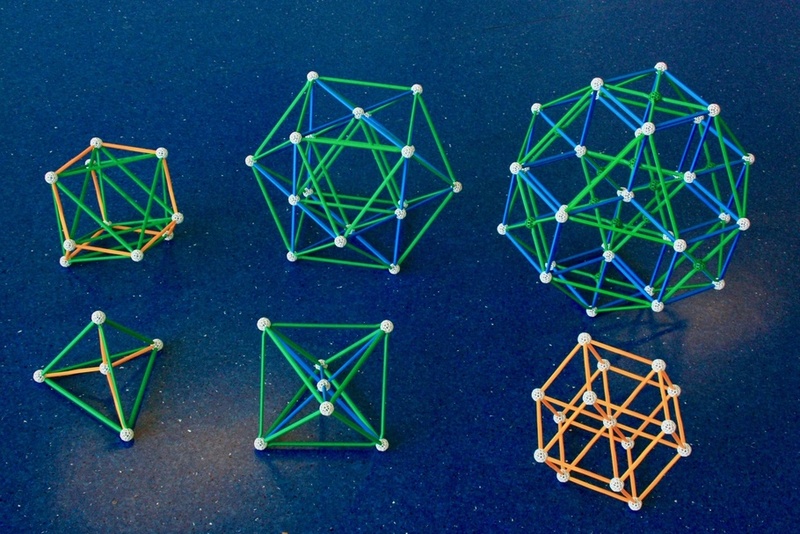 It is not possible to project all the edges into a 3-D Zometool model, so we must choose a sub-set. In this case, we chose the edges of the projections of the two concentric 600-cells, exactly as in David Richter's model. Here we can see that projecting higher-dimensional figures in three dimensions leads to a concentration of vertices and edges near the centre. 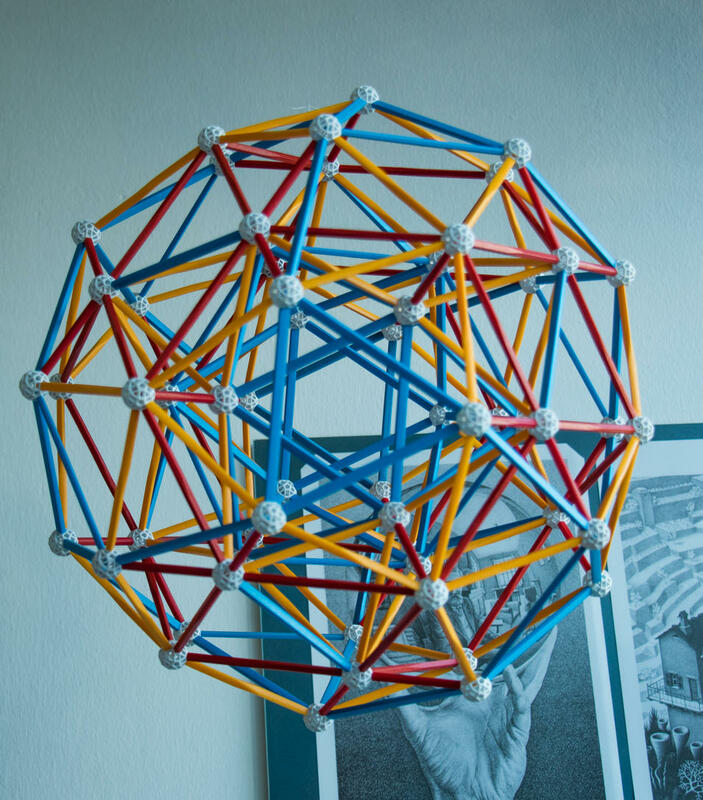 This model required many old very long struts, no longer manufactored by Zometool: 120 very long yellows, 120 very long blues, and 60 very long reds. Alternatively, the model can be made on a smaller scale. Fig. 37: Print on my door: The orthographic projection of the 8-dimensional 421 polytope onto the Coxeter plane where its projection has maximal symmetry. This 2-D projection highlights even more the concetration of vertices towards the centre, As its 240 vertices represent the root vectors of the simple Lie group E8, the polytope is sometimes referred to as the ``E8 polytope''. Using a complex number coordinate system, it can also be constructed as a 4-dimensional regular complex polytope known as the Witting polytope. Image by Claudio Rocchini (Own work), via Wikimedia Commons. 8 315 553 613 086 720 000.
which is about 6000 times the number of atoms on Earth. As John H. Conway has said, we've only started scratching the surface of the laws of symmetry! ``Regular Polytopes'' by H. S. M. Coxeter. This is the book for people who want to understand regular polyhedra and regular polytopes. If you want to go overboard, then get ``Regular Complex Polytopes". ``The Fifty-Nine Icosahedra" by H. S. M. Coxeter, P. du Val, H. Flather and J. F. Petrie. A charming little book on the stellations of the Icosahedron. ``Mathematical models", by H. Martyn Cundy, A. P. Rollett. This is a very nice but inexpensive book that includes most of the paper models in my office, and much besides polyhedra. ``Polyhedron Models", ``Dual Models and ``Spherical Models" by Magnus Wenninger. These detail methods for building a very large number of polyhedron and related models, particularly uniform polyhedra. 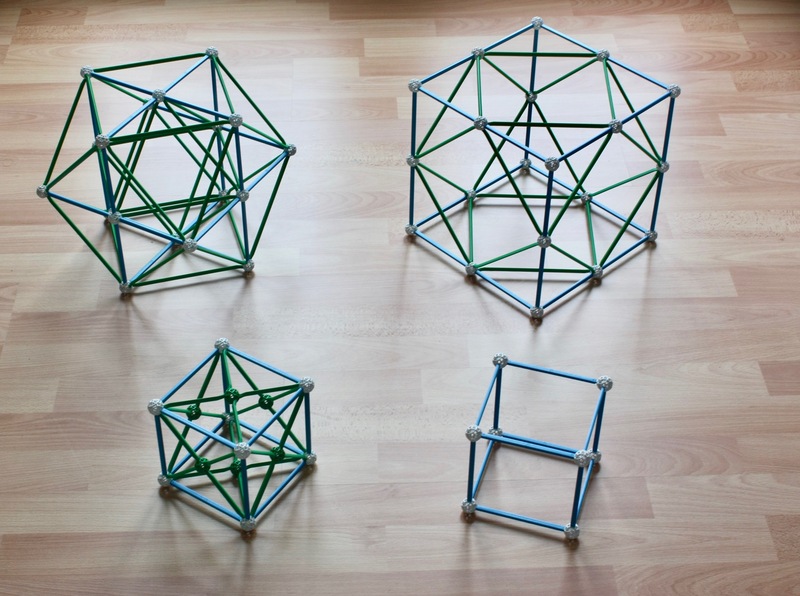 ``Zome Geometry: Hands-on Learning with Zome Models" by George W. Hart. 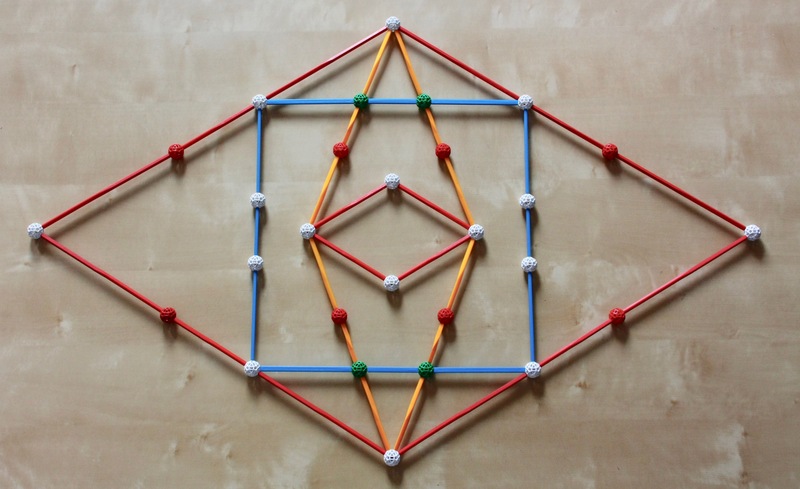 This is a very nice introduction to the Zometool system. ``The Symmetries of Things'', by John H. Conway, Heidi Burgiel and Chaim Goodman-Strauss. This is a very fun, deep and extremely well-illustrated book on everything symmetric, with a very modern approach. The most valuable resource for anyone in the first stages of learning any topic must surely be Wikipedia, one of the best things to happen in the Internet age. I link to it extensively in this page. 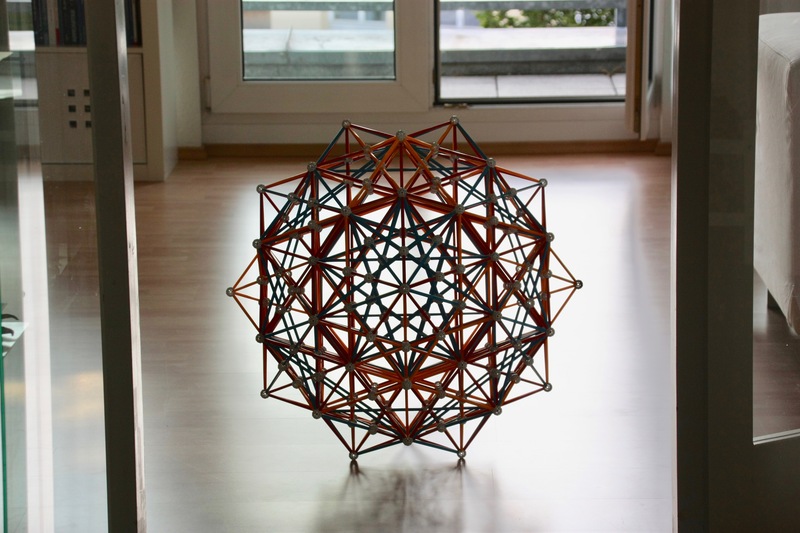 David Richter's page, which includes a very nice list of Zometool projects. Many of the models in my office (600-cell, first stellation of the 120-cell and others) were built following directly the instructions in these pages - I learned a lot building those models! Most others were inspired by models that appear in these pages. A big Thank You to David for the very inspiring and educational resource! George Hart's page. From his beautiful site and its links you may explore the whole polyhedral universe. Eusebeia 4-D visualization. This is very useful for figuring out how to build Zometool projections of 4-D regular and uniform polychora.